This mild pepper from Japan has become quite the culinary rage over the last handful of years. I first had them as a snack in a benefit cooking master class for Slow Food NYC, and have been growing them in my garden ever since. Shishito peppers are slender, bright green, and about the length of your index finger. 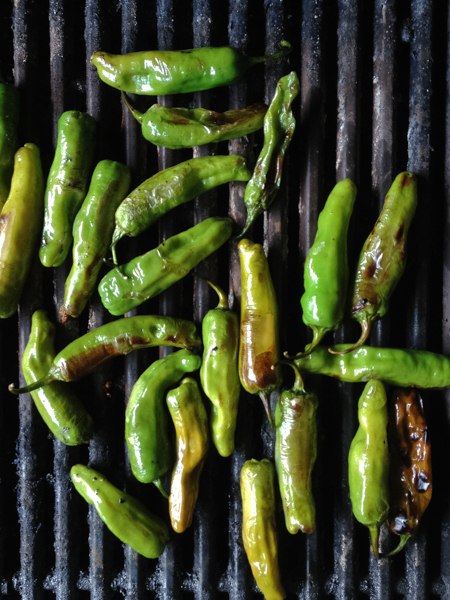 They are super flavorful yet mild, with about one in a dozen delivering a memorable amount of heat. Consider it a party game. I love serving a huge platter of grilled shishitos with cold cocktails at the start of a big summer dinner party. Quick, easy, impressive, slightly unusual and pretty much universally adored--there should be no hesitation in adding these to the menu. 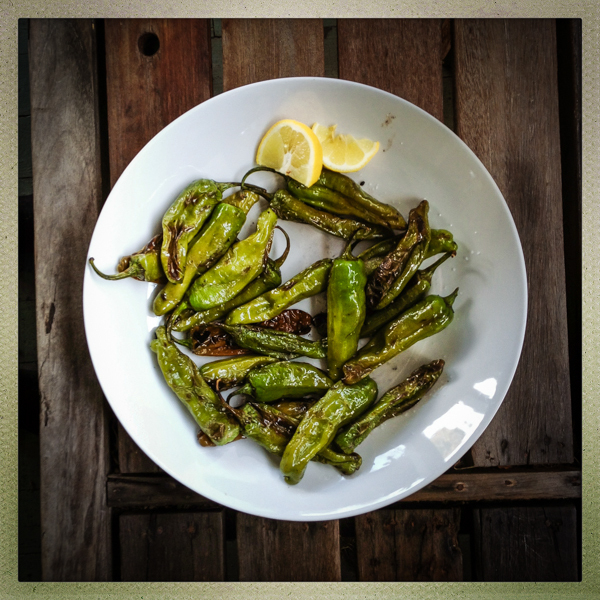 Padron peppers can be prepared and served the same way, but will be hotter in flavor overall. We are in high shishito season right now, so keep an eye out at the market, and definitely grow your own next summer. Grilled shishitos always fly off the platter when I serve them. Plan for at least 3-4 per person, if not many more. Wash the peppers and dry thoroughly. In a large bowl, toss peppers with a generous pour of olive oil, until evenly coated. Grill on high medium-heat until evenly blistered and slightly charred. Remove peppers from grill and transfer directly to a serving platter. Sprinkle with kosher or other coarse salt, and a very liberal squeeze of fresh lemon juice. 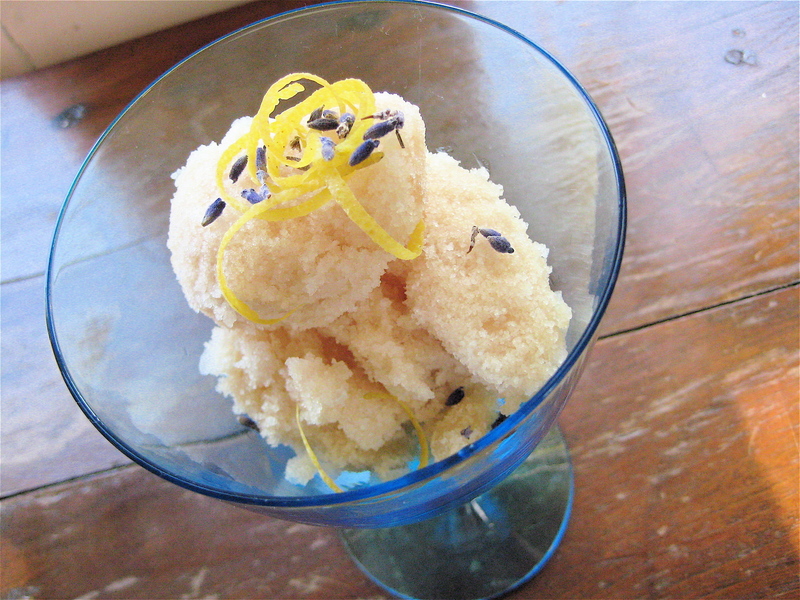 Serve immediately with additional lemon wedges. I made this quickly in the blender this week, to go over a cold rice salad with shredded poached chicken, local corn, a few early tomatoes and chunks of avocado. Mostly the goal was to distribute the little bit of avocado I had on hand as much as possible throughout the salad. We loved the result, and I expect we'll be drizzling this all over salads, soups, sandwiches, and all sorts of grilled things all summer long. 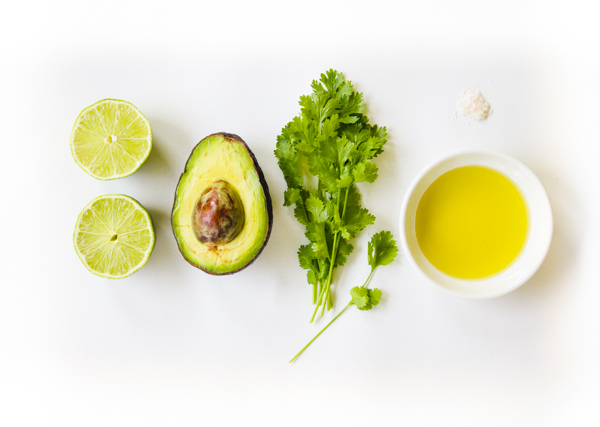 In a blender, combine avocado, lime juice and cilantro. Blend until smooth. Through the hole in the blender lid, slowly pour in the olive oil, with the blender on low. Start with a half cup, and taste for balance. 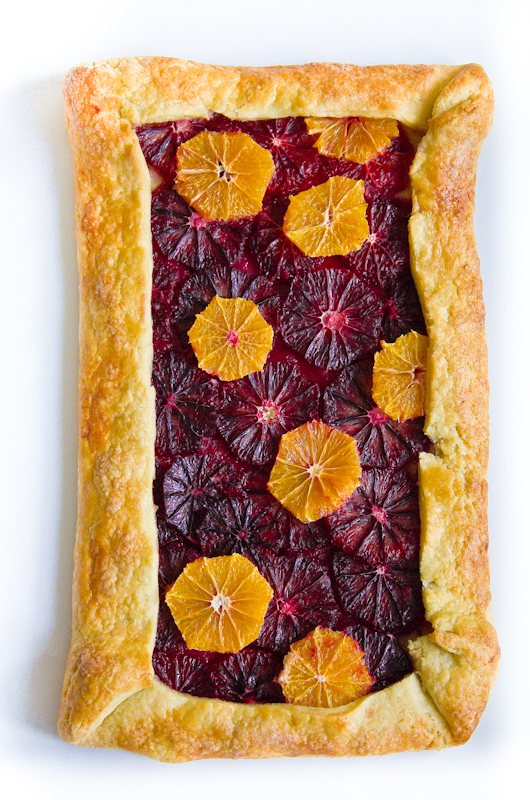 If it seems too tart, add a little more gradually, tasting as you go. Season with salt, to taste. Serve immediately, or chill briefly. 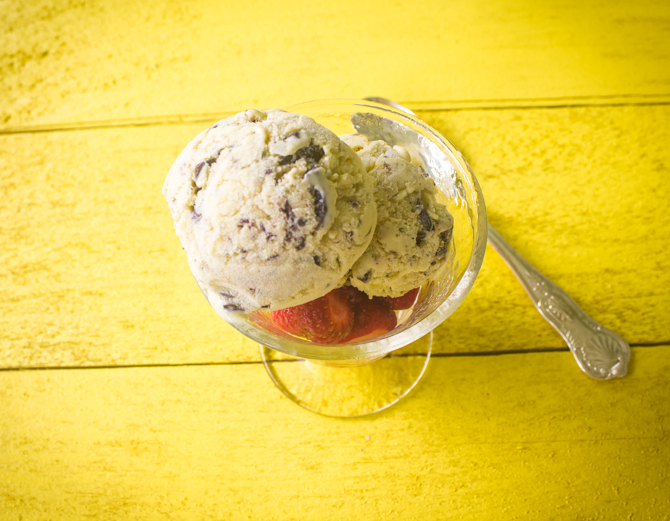 Make this right now, with all those plump ephemeral strawberries lurking around. (If you are making this out of season--gasp--consider adding a small pinch of sugar to the berry puree to help boost the flavorless winter berries). If you can make it past eating it directly from the mixing bowl, serve this dressing over a spinach salad with toasted pecans or walnuts and some crumbly goat cheese. Or dip some grilled chicken into it. Or grilled pork. Or duck. Or heck, put that on the salad too. Oh, and do yourself a favor: get some really good balsamic vinegar. yeilds about 1/4 cup, for two servings. 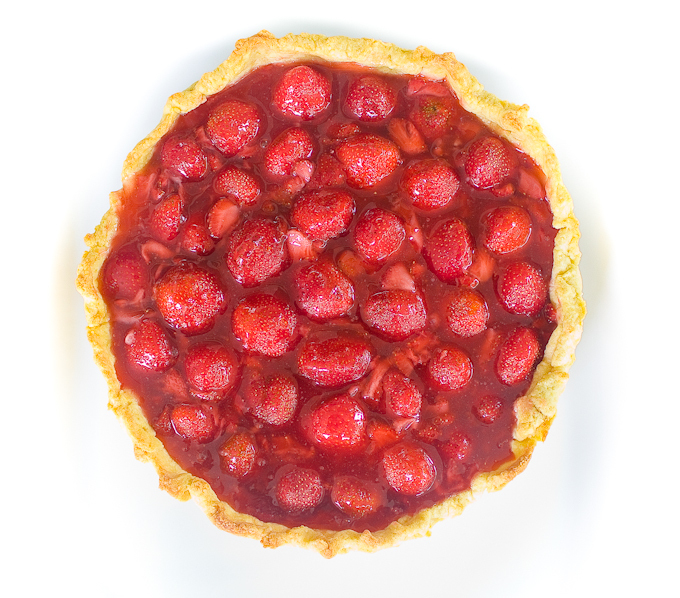 Heat the oven to 375º F. Halve washed strawberries and roast on a baking sheet for 10-12 minutes until soft and fragrant. The time will depend greatly on the ripeness. Watch the berries closely so they don't burn. Remove the berries from the oven and puree in a blender or food processor. 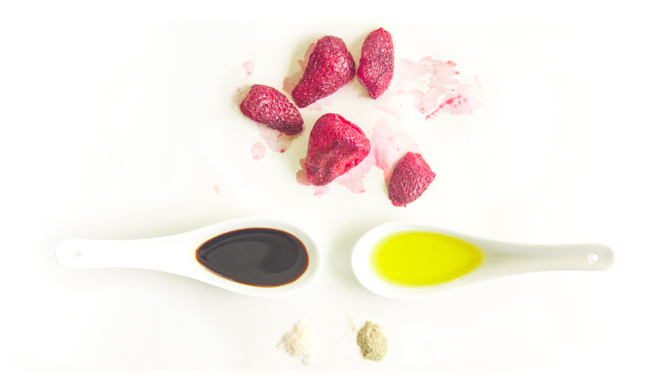 In a small bowl combine berry puree, balsamic vinegar, a slight pinch of ground white pepper and salt. Whisk to combine. 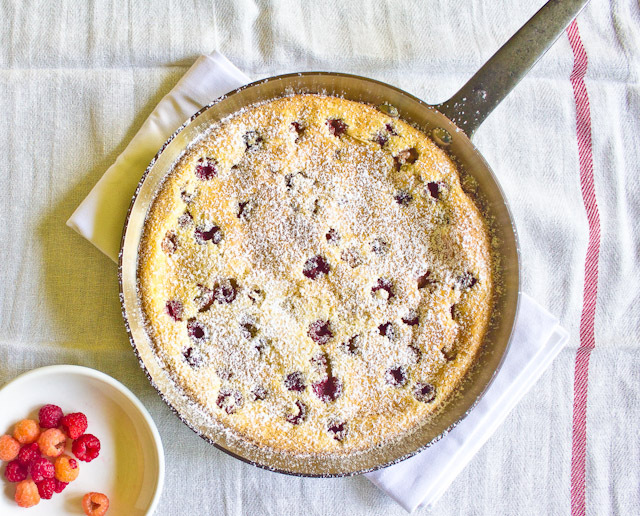 In a very thin, slow and steady stream, pour the olive oil into the berry mixture, while whisking continually. Taste and adjust salt and pepper. Serve immediately or chill briefly. Last night I was having dinner with some of my favorite lady friends, and we were talking about salad dressings, as you do with your lady friends. They were saying that they each always make their same standby dressing, and were enjoying this new blog feature to help get out of their ruts. We shared what each of our quick, don't have to think about it, dressing recipes are, and I had forgotten that for the longest time this one was mine. The mellow rounded sweetness of the sherry vinegar and the rich roasted nuttiness of the hazelnut oil are a combination that is tough to beat. It also makes one of my favorite birthday or hostess gifts. A bottle of each, and perhaps some great salad servers, have yet to make anyone unhappy. Use this dressing as an excuse to use up any hazelnuts that are left over in your pantry from some long-forgotten holiday cookie recipe. I love subtly mirroring the dressing in the salad ingredients. Combine vinegar and salt in a bowl, stirring gently to combine. 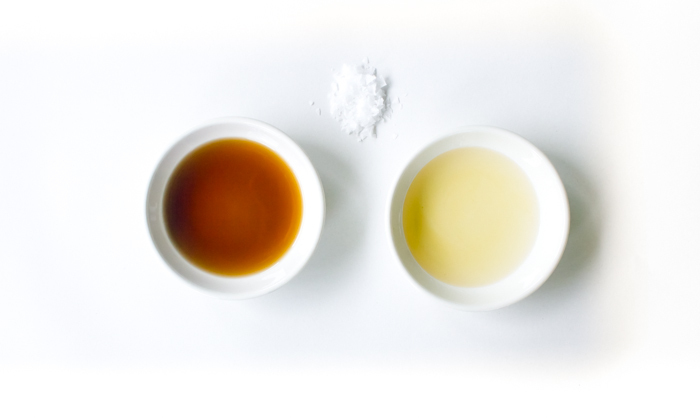 In a slow, thin, even stream, drizzle the oil into the vinegar while whisking constantly. Taste by dipping a salad leaf into the dressing. Adjust salt, if desired. For another step in my continued fight to close down the salad dressing aisle in grocery stores, I'll offer you a homemade salad dressing recipe each week. Fresh oregano certainly has a pronounced flavor, but actually so much more mellow and herbal and complex than what dried drab green flecks and pizza restaurant shakers have lead you to believe. We had this dressing last night on crisp fresh red leaf romaine, a small handful of fresh sorrel leaves (both sliced into ribbons, both from our garden), cucumber, and a generous handful of toasted sesame seeds. This vinaigrette would also be incredible on a salad of baby spinach, chickpeas and sliced hardboiled egg, or as a base for a potato salad. Also, P.S., oregano is probably the most idiot-proof herb to grow, super hearty, pops up first in the spring and faithfully returns each year. Grab a plant and stick it almost anywhere in your yard now for years of salad dressings and marinaras to come. Makes enough to dress one 4-person salad. Combine vinegar and oregano leaves in a medium sized bowl, bruising leaves gently with a whisk to infuse the vinegar a bit. Allow to sit for a few minutes. Add dijon mustard and a small pinch of salt and black pepper, and whisk gently to combine. In a thin, slow, constant stream, pour the olive oil into the vinegar mixture while whisking constantly. After adding three tablespoons of oil, check the flavor. If it feels a little tart or too strong, add an additional bit of oil to round out the flavor. Season with additional salt and pepper if desired. Toss asparagus stalks in olive oil and sprinkle lightly with salt. Roast asparagus at 350° on a baking sheet in the middle of the oven, until tender. Depending on the thickness of the stalks they will take about 15-20 minutes. Half way through roasting gently move the stalks around, turning them over to cook evenly. Allow the asparagus to cool slightly. 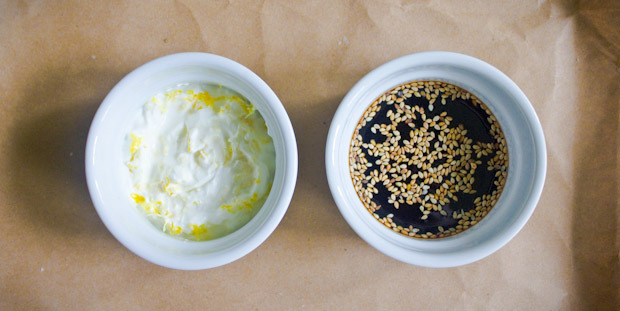 Dress with a delicate drizzle of sesame oil. Sprinkle with black and white sesame seeds and toss to combine. Serve as the base of a frisee or mixed greens salad topped with a poached egg and a very lemony vinaigrette. local color on my drive home. It has been a pretty swell week for this little blog. First, I get the baby to nap just long enough that I manage to post my first recipe in months. Then, I get not one, but two really lovely mentions, on the websites of not one, but two major publications I adore. Gourmet Live, the blog of Gourmet Magazine featured my Cornmeal Crusted Soft Shell Crab recipe as its Image of the Week. Swoon. 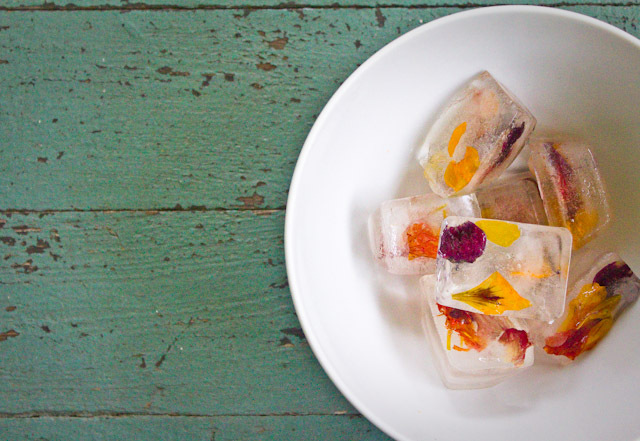 Then, today my photo for my edible flower ice cubes was featured in a slide show on Bon Appetit's site. I'm the second slide. Right after Martha. Stewart. And the really lovely bonus of both of these mentions is that they reminded me of two recipes which I really enjoyed from last summer, and will revisit again now. 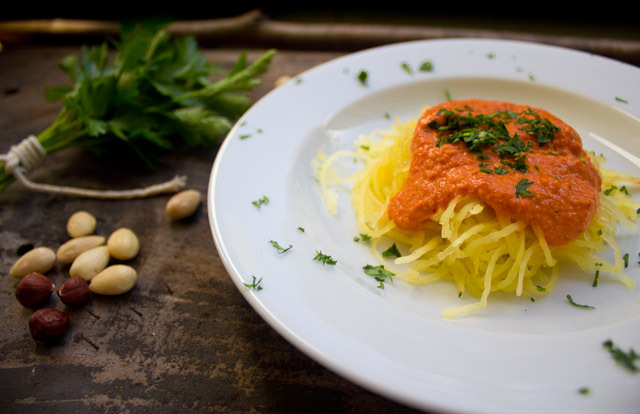 Dreaming of our trip to Barcelona, that was this month a year ago, I tried combining two of my favorites: spanish romesco sauce with just-picked spaghetti squash from our garden. Nutty, tangy, rich and warm, with a wonderful crunch from the squash, I literally had to make myself put the mixing spoon in the dishwasher so I would stop eating and have enough to photograph. Romesco is a very traditional spanish sauce originating in Catalonia. It is incredibly rich and creamy, thanks to pulverized toasted almonds and hazelnuts included to thicken the sauce, that also provide an extra dose of protein. As with most ages-old, traditional dishes, the recipe varies from cook to cook, including this cook, and is a reflection of how they view it most balanced. In addition to using it here with spaghetti squash, it is incredible with grilled fish and vegetables, as well as a dip, or spread on sandwiches. It is a great way to use up those few remaining, not-exactly-pretty, tomatoes and peppers looking for a home at the markets right now. I just discovered the Telepan TV channel on youtube. Bill Telepan is one of my most favorite NYC chefs, who I had the great, great pleasure of cooking with for many months that the start of his inspirational and important Wellness in the Schools school lunch campaign. He has started to put together videos, sharing some of his incredible recipes from his incredible restaurant Telepan. The three recipes using cherry tomatoes in the video above are making me very. very. hungry. Run! and get some cherry tomatoes at the markets this weekend while they are still available (we had a frost at our house last night!). Glorious cobs of corn will still be around at the farmers' markets for a couple of weeks. Sweet, meltingly tender, golden or pearly white, they are never better (or cheaper) than right now. We eat it with dinner nearly every night for the month when it is at it's best, just barely cooking it, as it doesn't need much more, and then say farewell for another eleven months. 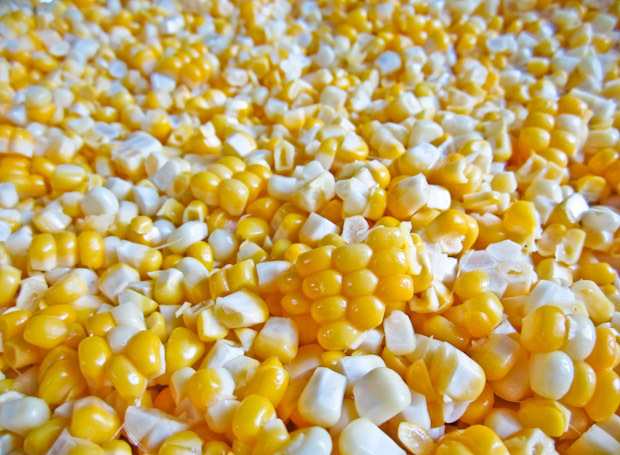 However, we also religiously freeze corn to use in meals in the months ahead. Pulling out and defrosting a bag of farmer's market kernels feels so luxurious in the depths of winter--not to mention a tremendous vitamin-packed time and money saver. Great for chowders, soups and chili, I'll also combine the corn with my frozen peppers for a tex-mex-y topper for eggs, or a perfect start for fajitas and burritos. Slowly saute some onions along with them, and add a little cumin, chili powder, ground corriander, and epazote for a colorful, sweet, base for a meal. 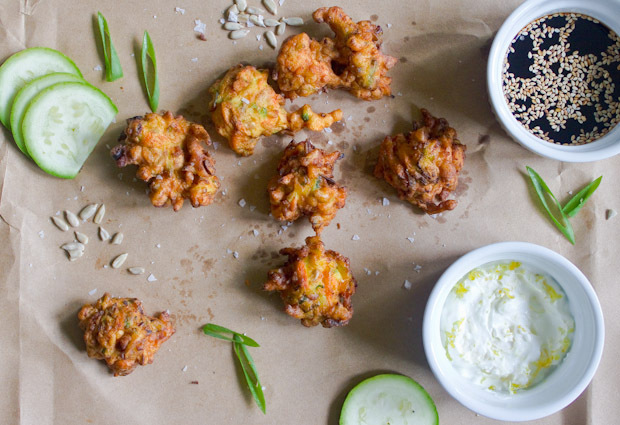 These fritters are an homage to the perfect little hometown restaurant we had in our shoreline Connecticut town growing up in the 80s. A place where everybody knew our name, where you could pop in casually for a wholesome lunch, or count on it for a suitably festive and elegant special occasion dinner. But what is most interesting to me in hindsight, is that what was 80s nouvelle cuisine, was in many ways using a huge amount of the same ideas of locavore cooking now--using the freshest possible ingredients, lighter sauces or preparation to let the produce or proteins really be the focus, an overall lighter, fresher, more in-the-moment way of cooking. The only difference being that then it seemed revolutionary and nouvelle, while today it is seen as a return to the basics. This fritter is exactly in keeping with that. 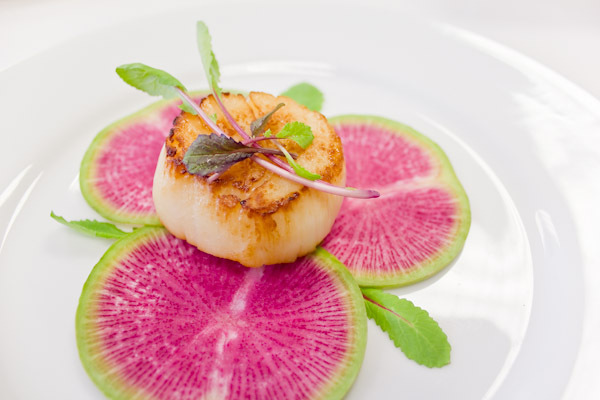 The freshest possible ingredients, at the height of their season, minimally dressed up. In the 80s something like this seemed very exotic, today it feels like the perfect, summer, wholesome appetizer, right out of a Deborah Madison book. And plus...ding! ding! ding!...it is something to do with all of those zucchini piling up on your counters, that you perhaps might be starting to resent in just the slightest way. In a medium bowl, sift together flour, baking powder, salt and pepper. Set aside. In a larger bowl, whisk together milk and eggs. Add the dry ingredients to the milk mixture and whisk until smooth. Grate the zucchini on large holes of a box grater, or with the grating blade of a food processor. Squeeze in several layers of paper towel to remove as much liquid as possible. Grate carrots to the same size. Add both to the batter. Thinly slice the scallions. Add scallions and sunflower seeds to batter and mix to thoroughly combine. Fill a pot with canola or peanut oil, until it is 2 inches deep. Heat the oil to 360 F. Carefully drop about one tablespoon-sized dollops of the batter into the oil (they will puff up considerably). Do not put too many fritters in the pot at once, as the temperature of the oil will decrease too much. Also if the fritters are too large they won’t cook through by the time the outside is sufficiently browned, and will still be raw in the middle. Fry until golden brown, turning over once when cooking, about two minutes total. Turn the heat down if the fritters are browning too quickly or the temperature continues to rise. 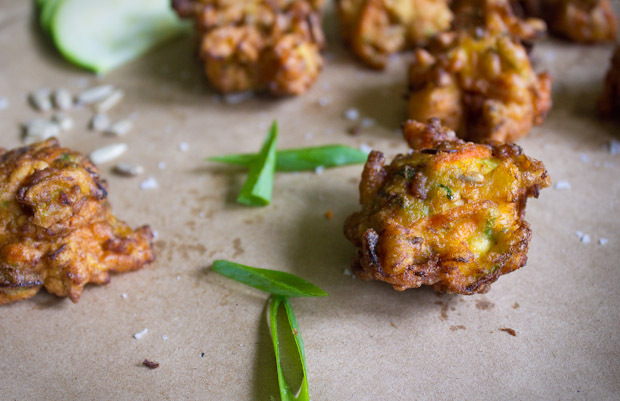 Remove fritters with a slotted spoon to paper towels to drain. Salt lightly while still hot. Serve warm. This may be the garnish to end all garnishes. I remember so vividly the day we learned this in culinary school, and how I raced home to try it myself, feeling like I had just unlocked some illusive five star chef secret. This simple little technique gives you magnificent, fragrant green gold to drizzle about a plate, swirl atop a bowl of soup (it floats! ), and dunk very lucky crusty bread in. Seriously, this just smeared on a white plate, and you look like a superstar. 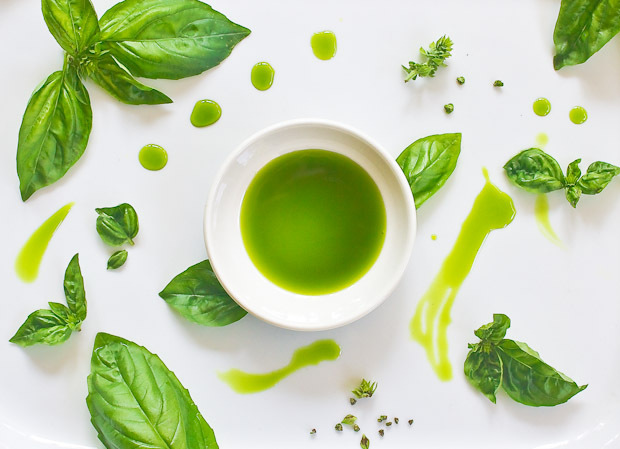 Regular ol' oil becomes glistening emerald and is all things basil...or parsley or cilantro--it works for a variety of herbs. I made a thai basil-cilantro oil to drizzle around a Thai-spiced quail dish that worked beautifully. The oil will keep for about a week in the refrigerator. I've also frozen it in ice cube trays to defrost later in the year, to swirl on top of a creamy soup, or drizzle along side some roasted salmon. But try this now, even to just dress up some sliced tomatoes. There. Is. Nothing. Better. 6. Strain oil through fine strainer lined with several layers cheese cloth. (Tip: Wet and wring out the cheesecloth before putting it into the strainer. This will rinse out any dust particles from the packaging, and the cloth, if saturated with water, will absorb less of the precious oil.) Pour into squeeze bottle or airtight container. Will keep in the refrigerator for about a week or can be frozen for several months, defrosted for a few hours in the refrigerator. Note: You'll want to use a mixture of oils here. The grapeseed oil is much lighter and much more neutral in flavor, so it will best allow the basil flavor to come through. But adding a little olive oil to the mixture, gives it some heft and richness that will also compliment the food you are putting the oil on. The measurements can be approximate, but shoot for a 70/30 ratio. You'll need enough oil to cover the leaves in the blender, somewhere between a quarter and a half of a cup. 1. Pour boiling water over the fresh herbs in large heatproof bowl. Let steep for thirty seconds. 2. Add ice and cold water to the bowl to stop the cooking of the leaves. 3. Remove the herbs from the water and squeeze dry, then squeeze again, hard, with paper towels to remove as much water as possible. 4. 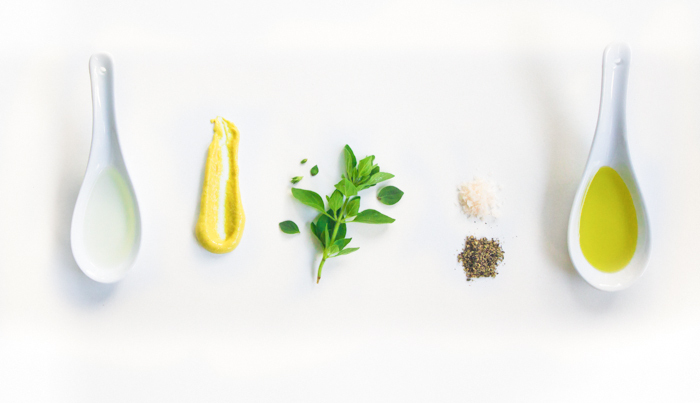 Put blanched herbs in a blender. Pour in enough grapeseed and olive oil to just cover the height of the leaves. Blend well for about a minute. 5. Pour pureed herb and oil mixture into sauce pan on medium heat. You will see a much brighter green color start to form on the outside rim of the pan as the particles of the herbs start to cook through. Stir gently, until the entire pan has changed to the brighter color, approximately 1-2 minutes. 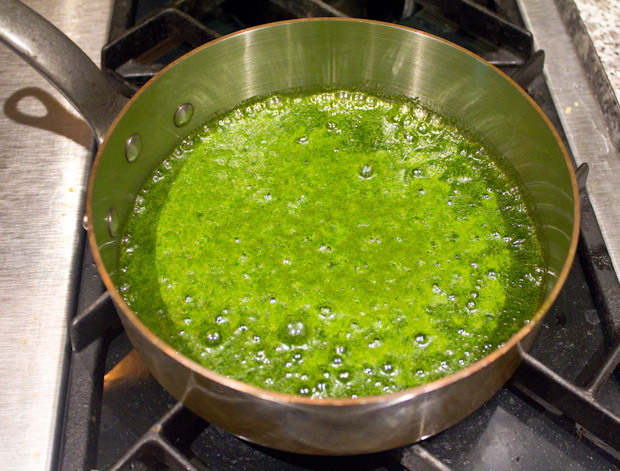 Do not let the oil boil or cook at too high a heat, and burn or fry the basil. Turn down if bubbling too rapidly. Try a new one on your next trip to the market. What's old will be a little newer again. 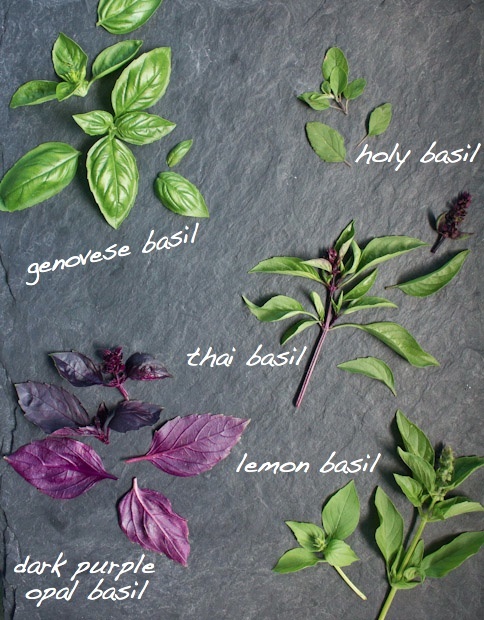 Genovese Basil: The traditional Italian large-leafed sweet basil that we all know and love. Ideal for all things pesto, but best when the leaves are small. If the leaves are huge, blanch them quickly to remove some of the (too) strong flavor, making them more suitable for a delicately balanced pesto sauce. Holy Basil: Becoming more and more popular on menus with chefs, it is called holy basil primarily because it is used as an offering in South Asia in Hindu temples. Generally eaten raw, it has a bright, sweet smell, that is strikingly like Juicy Fruit gum. Thai Basil: This is those big fragrant sprigs strewn across your Thai green curry noodles, or tucked inside a Vietnamese summer roll. A deep magenta stem with small green leaves, it is much spicier than Italian basil. Heavy anise and clove flavors compliment Southeast Asian cuisines perfectly. Dark Purple Opal Basil: There are several purple basil varieties out there, and I always love to have at least one plant in my garden. Very similar in flavor to traditional Italian basil, it is a gorgeous way to add unexpected color to a dish. 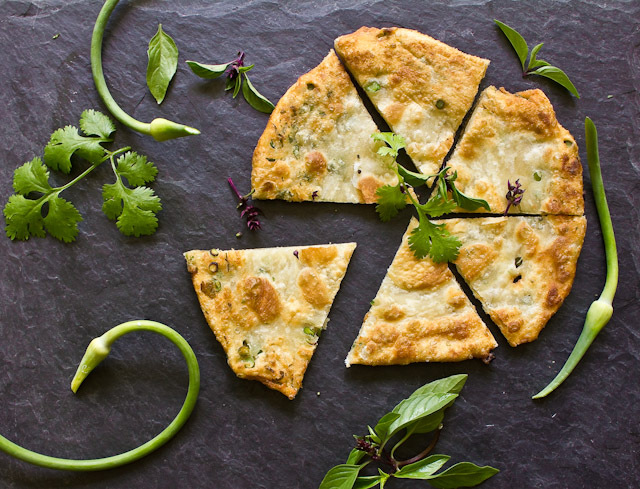 Thinly slice with green basil for instant edible confetti. Lemon Basil: Smaller leaves with a deep citrus smell and taste. A great compliment to seafood dishes, cocktails, and summer salads. 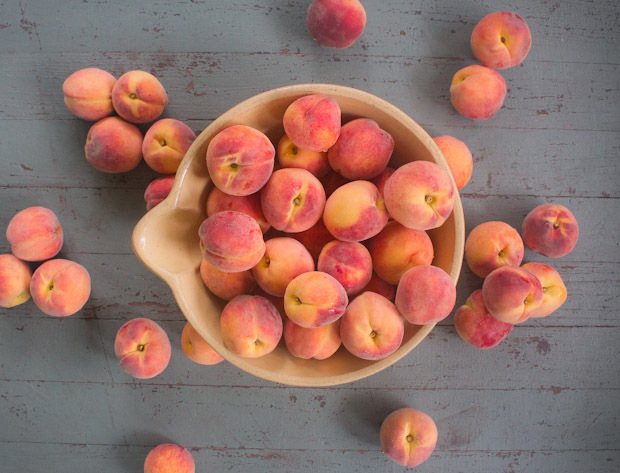 Peaches and other stone fruit are perfect and plentiful (and pretty cheap!) at the markets right now. 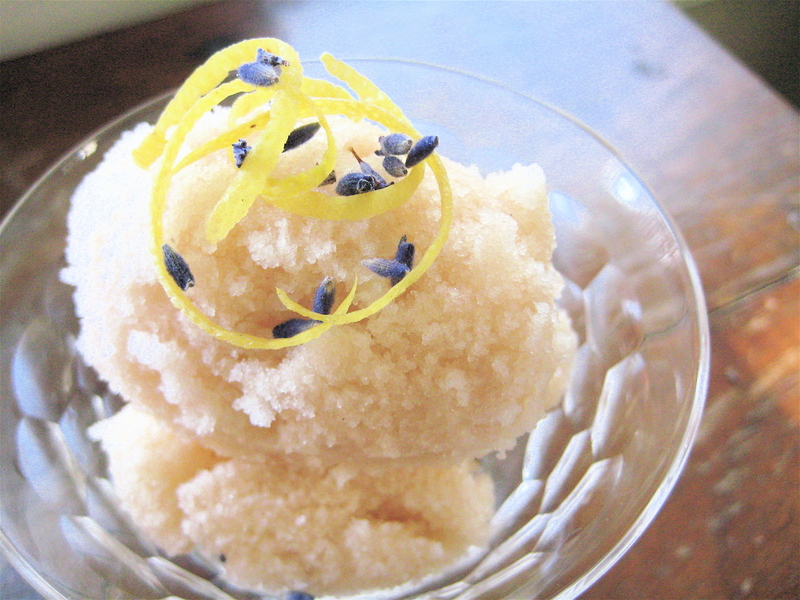 Taking an hour or so and freezing a bunch will be total treasure in your freezer come winter. 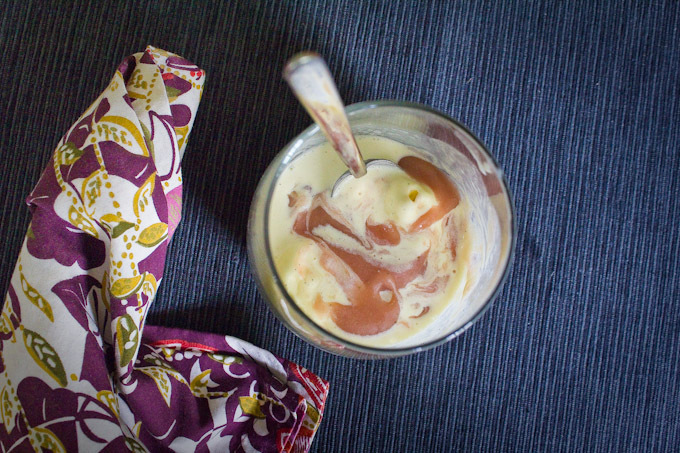 And...far extend your season for making David Lebovitz's ridiculously good peach ice cream (it contains sour cream, people! Sour cream!!). 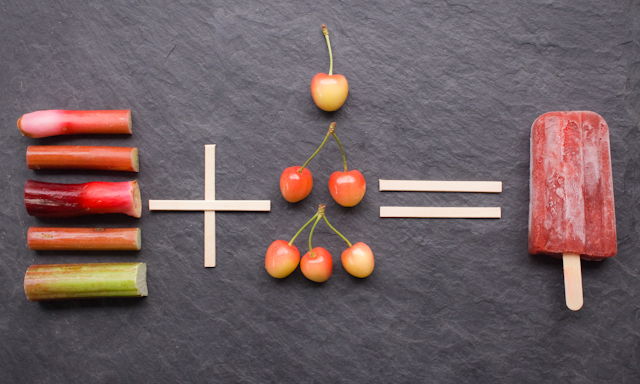 Here are a couple of quick, and a little easier, tips for puttin' up the peach. Blanching (to remove the skin). 1. Bring a large pot of water to a boil. 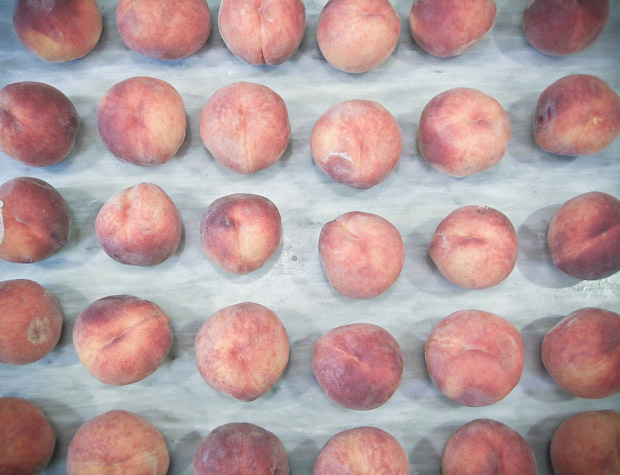 Wash whole peaches. Don't bother to dry. 2. Cut a small "X" in the bottom of the peach with a sharp knife, just cutting through the skin. This will give the skin a place to start to slip-off when blanched. 3. Slowly lower peaches, several at a time depending on the size of your pot, into the boiling water. 4. Remove peaches from the boiling water after one minute with a slotted spoon. Immediately transfer the peaches to either a large bowl of ice water, or a colander and run under very cold water. 5. Starting where you made the "X" on the bottom, just literally slip the skin off the peach with your hands. It will come off very very easily. 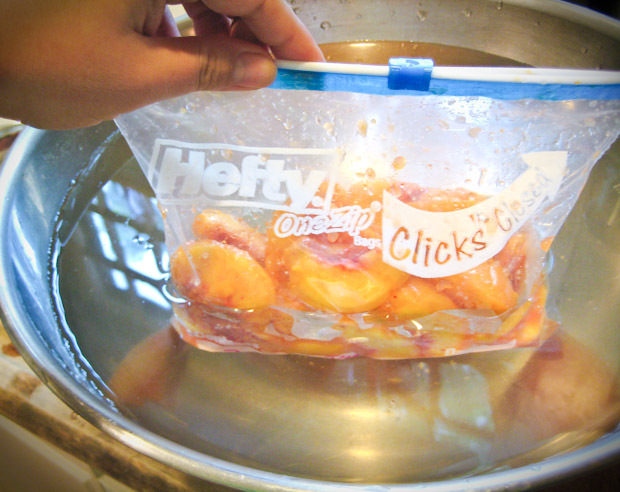 To extend the life of your frozen peaches, and ward off freezer burn, you want as little air in the container with the frozen fruit (and vegetables too) as possible. Sucking air out of a freezer bag with a straw, and then trying to zip-lock-it as quickly as possible was my method of choice for years. But this method below, using water to displace the air, has worked much better, and much quicker, for me in recent seasons. 1. Fill a large bowl with water, leaving some room at the top. 2. Lower a freezer-safe bag, filled with whatever you are freezing, into the bowl, with the top of the bag still partially open, with room for air to escape. 3. As you lower the bag further into the bowl, the water will surround the shape of the bag, and press out a good amount of air. Continue to lower the bag, until the level of the water is as close to the top of the bag as you can go, without risking getting water in with the fruit. Seal bag immediately and remove from bowl. 4. Gently press on the fruit in the bag to redistribute and make it flatter for storage in the freezer. Label and freeze. Peaches will keep for about six months in the freezer. 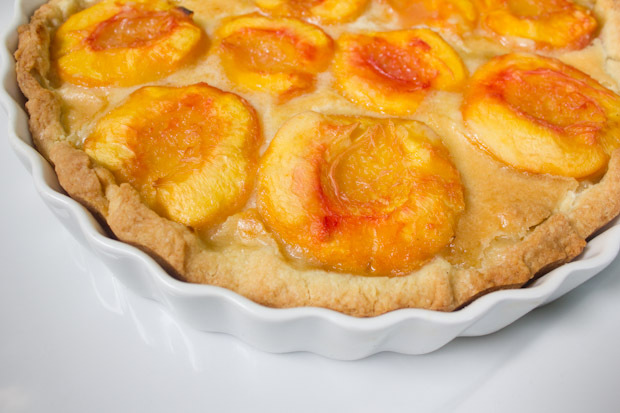 Peach pie in February anyone? 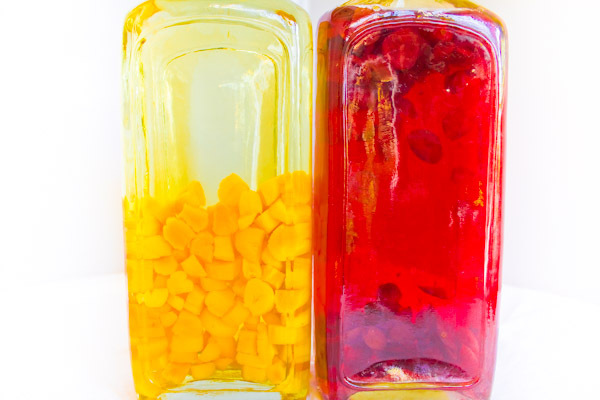 To preserve the color a little better, you can add a little citric acid or Fruit Fresh, both available by canning supplies, to the raw fruit before bagging it. Add 1/4 teaspoon to every quart of fruit. Here is a quick recipe I dreamt up, while on my roasted produce kick this week, using what is in abundance in the gardens and at the market. Thankfully, it turned out to be heavenly, lick-the-bowl-clean good. There is a magical, sum is definitely greater than it's parts, result here, as with many very simple summer dishes (think: Tomatoes+Basil+Olive Oil.). Sweet and sour and earthy and salty and bright and crunchy all going on in your mouth together. Roasting the nectarines and zucchini really intensifies their flavor and makes them both feel like vegetables...or fruit...or something new and unique completely. A beautiful side dish for any summer meal, I imagine this would also be spectacular atop grilled fish, pork, or chicken. Toss zucchini and nectarines separately in a 1/4 cup of olive oil total between the two, just enough so they have a slight sheen. Season with a good pinch of salt. Taste, and add more if necessary. 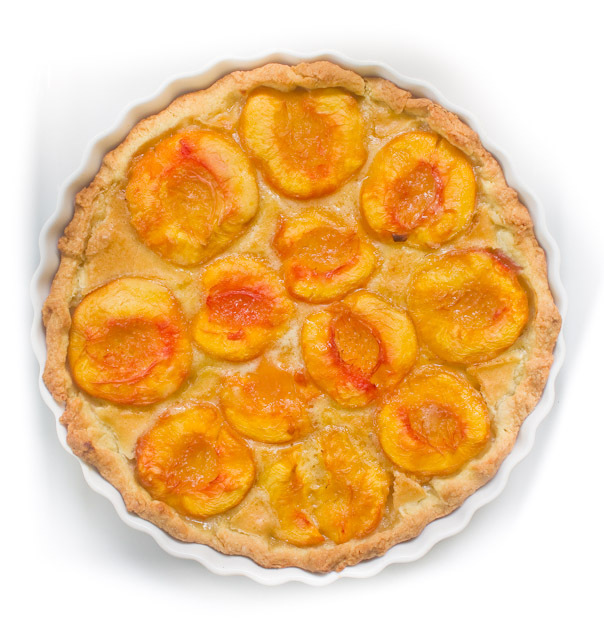 Place nectarines and zucchini on a baking sheet in a single layer. Keep them separate as they will be finished at different times. Place in the top half of the oven. After about 10 minutes check the zucchini and nectarines. If starting to brown on one side, gently turn over with a spatula. 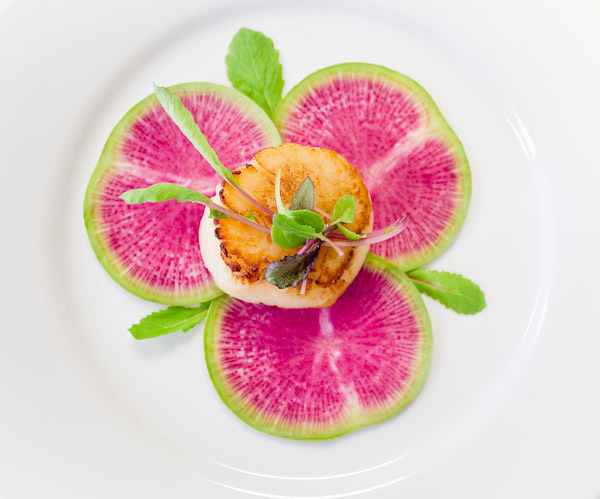 The cooking time will depend on the ripeness of your produce and the size of your pieces. For a half inch cube, my nectarines took 12 minutes and zucchini took 22 minutes. Check them again in a few minutes, and taste a piece to check for doneness. Remove from the oven when they are brown on the edges and tender, but not mushy, all the way through. Spread out on a plate or cool baking sheet and allow to cool. Either chill or leave at room temperature. Whisk together remaining 1/4 cup of olive oil and lemon juice. Hold off using extra salt in this vinaigrette, as the salt already on the roasted zucchini and nectarines and in the feta should be plenty. 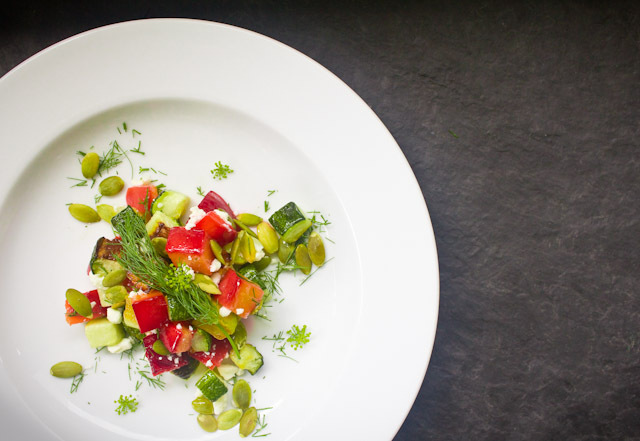 Just before serving, combine zucchini and nectarines, with feta, dill, and pumpkin seeds. Gently toss with the lemon vinaigrette. Taste, and add salt if necessary. Serve immediately. 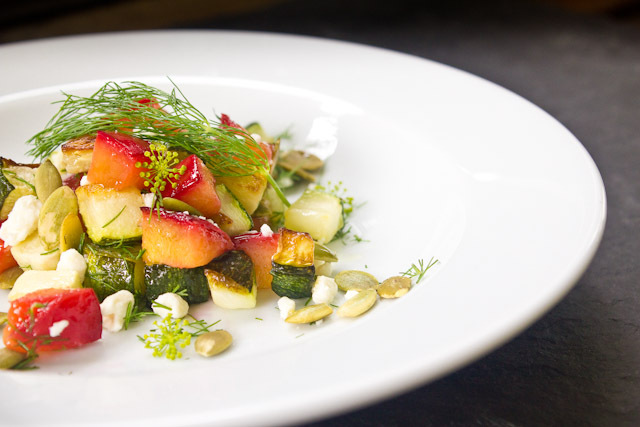 Zucchini and nectarines can be roasted a day in advance and kept in the refrigerator. Vegetable and fruit roasting feels like almost too basic a technique to even justify a whole blog post. However, several times during the year I have these ah-ha moments where I am bored with what I have been cooking and then suddenly remember to mix things up I just need to roast, which I somehow forget about for spells at a time. The long exposure to dry heat and the contact with the surface of a baking sheet or roasting pan transforms produce in ways very different than grilling, steaming or sautéing. Most importantly it evaporates much of the water in the fruit or vegetable, drying it out some (Take that watery zucchini! ), and deeply concentrating the flesh and the flavor. Also the edges of the produce start to get brown and sweet and caramelized and utterly irresistible after the natural sugars are exposed to heat and the surface of the baking dish. These weeks the gardens are bursting with flowers. Not the flower gardens, but the herb and vegetable gardens. Some of the flowers I planned on (nasturtiums and chamomile), some are part of the journey (pole bean blossoms which will become bean pods), and some are a result of me not harvesting fast enough and a bit of the plant going to seed (cilantro, basil, dill, oregano, and radish). I'm a big proponent of using as much of a plant or vegetable as I can. One of my favorite "tip to toe" recipes doing this is Chef Bill Telepan's Beet Greens Pierogi with Mixed Summer Beets and Brown Butter Sauce. 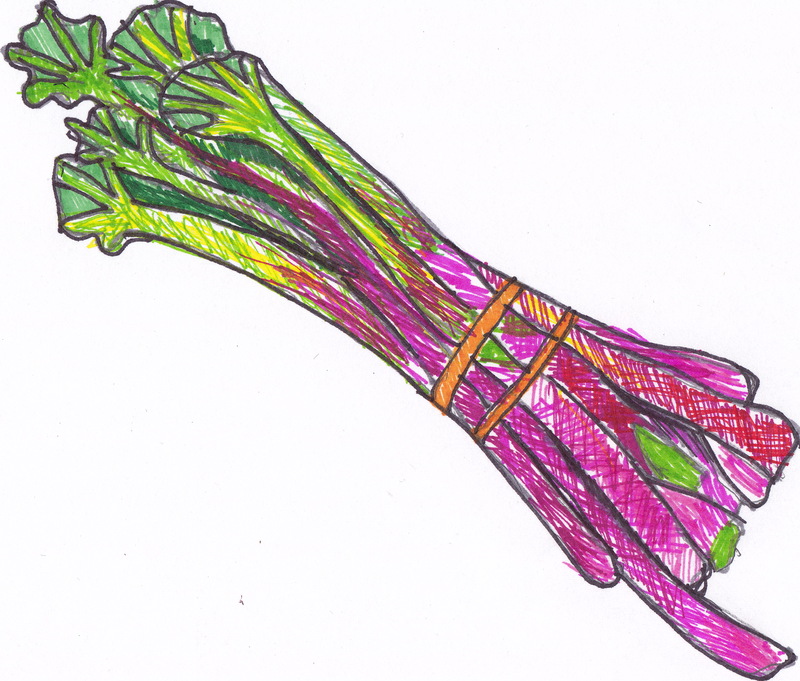 I also got much too excited when I learned in a master class in culinary school, with chef Michael Anthony of NYC's Gramercy Tavern, that I could pickle the technicolored chard stems I had been pushing aside and composting for years. It is equally exciting for me to use flowers in dishes. As mentioned, some are planned, some are not, but there is a lot of flavor, and a ton of color and texture there that would otherwise go to waste. They are not just a pretty face--and frequently fetch a premium price at the markets. Certainly make sure you know what you are serving and eating, so as not to go all Arsenic and Old Lace on unsuspecting BBQ guests. But there are so many varieties of edibles around right now, and just a small edition of a few feels very very special. Try to pick the flowers as close to use as possible. 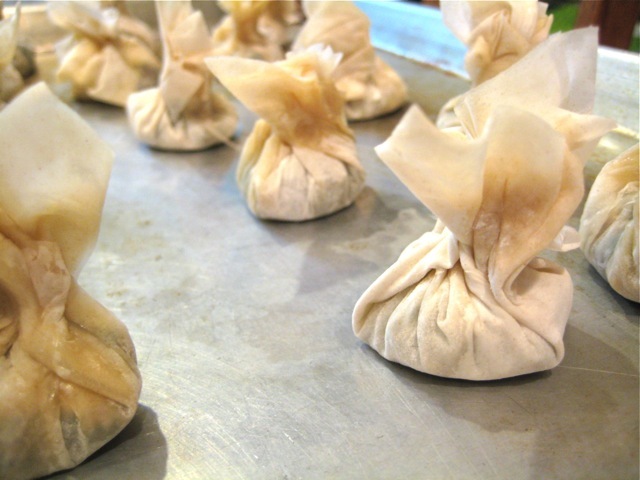 Store them, unwashed, wrapped gently in paper towel in the refrigerator, protected in a bowl or open container. Teeny tiny bugs love to hide out in their petals and folds, so examine each blossom carefully. To wash, and to refresh flowers that are a little droopy, plunge the entire blossom in a bowl of cold water for about five minutes, and then allow to dry on a paper towel. After washing, flowers can be floated. right side up, in a bowl of cold water until ready to go onto the plate. - Salads! 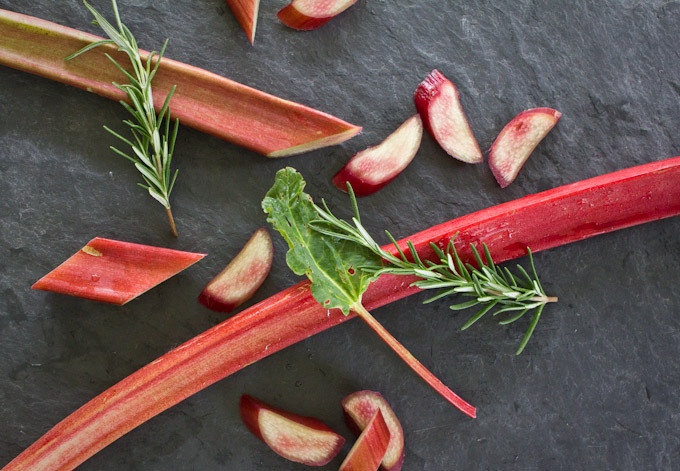 Whole or torn, little bursts of blossom color are a magnificent addition to salads. Nasturtiums in particular, leaves and flowers, with a wonderful peppery zing, are a great addition. 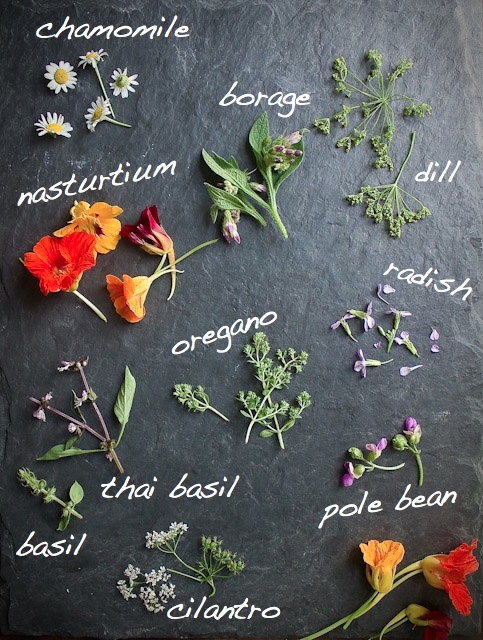 But also think about the flowers of complimentary herbs like dill, basil, cilantro, and chervil. Then consider adding some of the same herb to the dressing to tie it all together. - Garnish soups by floating a single blossom in the middle of the bowl. This is particularly effective with cold soups, as it won't wilt the flower. 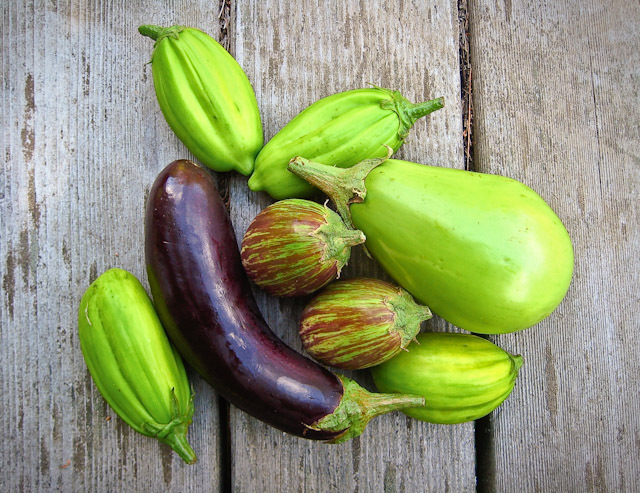 Try it with Borage, a beautiful purple flower with a taste very similar to fresh cucumber. - Decorate cakes, cupcakes and pastry with a blossom here and there. Edible flowers definitely each have their own flavor, so stick with the sweeter and more floral plants for this, like chamomile, lavender, and mint. - Tear up some petals and sprinkle them over a plate or platter like confetti right before serving. Or make a tiny micro salad of flowers to top a piece of grilled fish or meat. 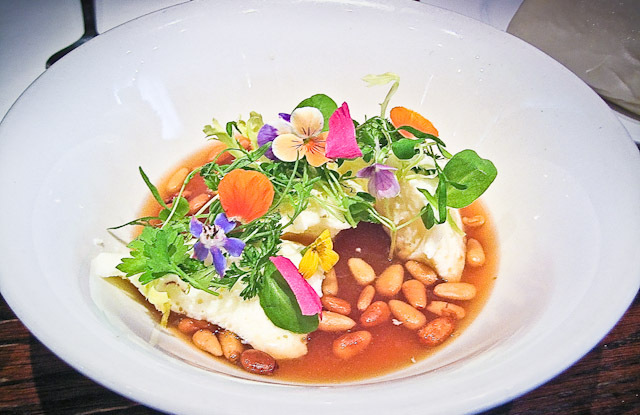 A quick snapshot from lunch--Buttermilk with Fuji Apple Dashi, Market Herbs and Flowers, and Pine Nuts at Momofuku Ssäm Bar, NYC. With our growing season a little later here in slightly cooler upstate New York, we still have bundles and bundles of garlic scapes in the markets and gardens for a week or two. A garlic scape is the flower shoot that has shot up from the stem of a hardneck garlic bulb when growing. The scapes are slender, bright green, and often twisting and turning in elegant swan-like shapes. Shortly after they appear, which seems to happen almost overnight, it is important to snap them off of the rest of the stem to allow the garlic plant to instead put its energy into growing the garlic bulb, which will be harvested a few weeks later. The scapes have a flavor that is definitely garlic, but much mellower, with hints of herbal summerness. They make a stunning pesto, turning into an outrageously bright green paste that keeps its color when cooked or frozen. I will often just puree garlic scapes with olive oil and freeze in about one cup portions that will keep for several months. Always on the lookout for new oils and vinegars for homemade salad dressings, this year I made garlic scape infused vinegar. It will still be a week or so before it hits its full potency, but so far so good, and the snaking scapes in the bottles are stunning if nothing else. 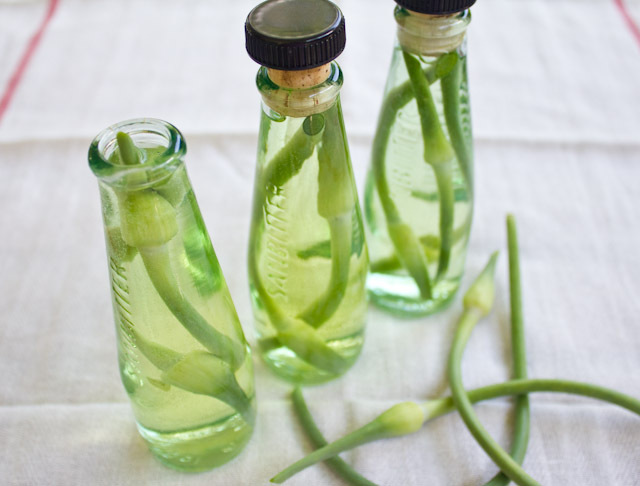 The vinegar will be beautiful in simple vinaigrettes to dress greens and cucumbers from the garden, and also added to a marinade for grilling meat and seafood, splashed on sauteed chard, collards or kale, or for dunking crusty grilled bread. If your herb garden is overflowing, you can certainly add a few sprigs of basil, dill, thyme, or even a dried chili pepper to the bottle for your own personal melange. Experiment, use what is around you, and enjoy. Note: I like the ratio of 1-2 scapes per cup of vinegar, but you can certainly add more to make the flavor more concentrated. And absolutely double or triple the recipe based on the size of container you are using. Triple the recipe, for example, if using a wine bottle. 1. Sterilize the bottle and cap, either by simmering in hot water on the stove for 10 minutes or washing in the dishwasher right before using. Allow to container and cap to dry thoroughly. 2. 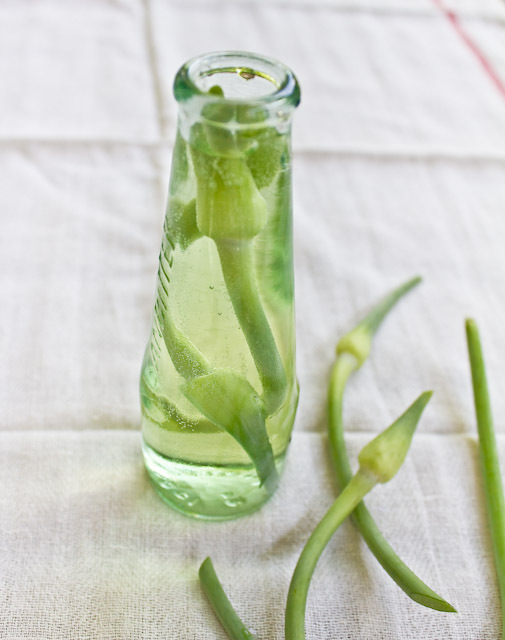 Wash garlic scapes and dry completely. Cut into lengths that will allow the scape to be completely submerged below the level of the vinegar. Any exposed piece of scape not in the vinegar will start to deteriorate and rot. 3. Gently bruise the scapes, by rolling over slightly with a rolling pin, to release a bit more flavor. 4. Place the scape pieces in the sterilized container and cover completely with vinegar. Cover with lid, cap or cork. 5. Store in the refrigerator, or other cool, dark place. The following day, check the level of the vinegar and add more if the level has dropped at all. It is possible that the scapes will absorb some overnight. 6. Allow to infuse for 10 days to 2 weeks, in a cool, dark place. Strain out original garlic scape pieces, if desired, and replace with fresh ones (if available), primarily for decoration. Will keep for 2-4 months. Keep vinegar bottle out of sunlight or it will become cloudy. The acid in the vinegar acts as an inhibitor for bacteria growth, but certainly keep an eye out for changes in color, an off smell, or cloudiness in the bottle and discard if there is a question. Storing the vinegar in the refrigerator, particularly in the summer months, is the safest. 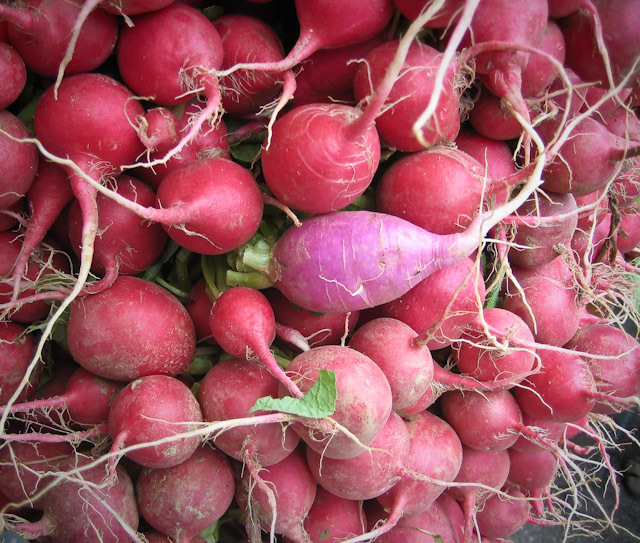 Radishes of every color are pushing their way up through the dirt of my garden and attracting paparazzi-esque crowds at the farmers' market. 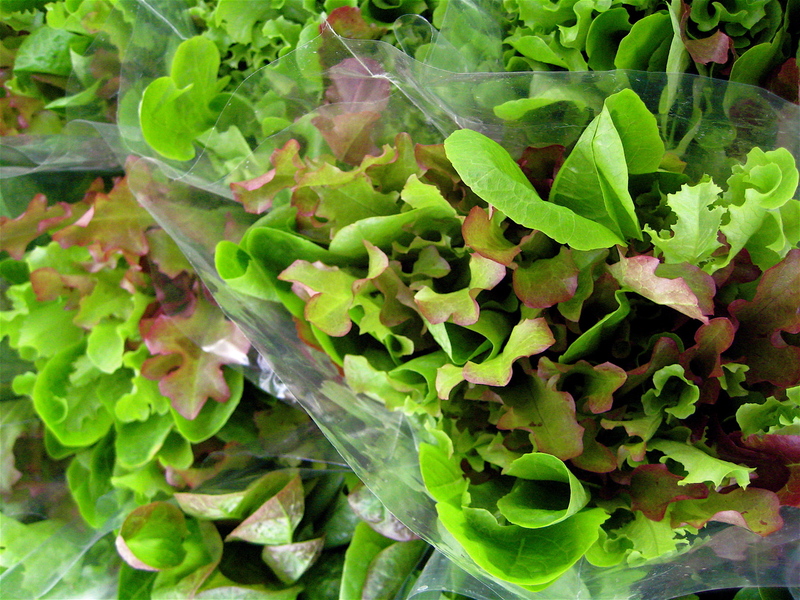 This fresh and this young, they are sweet and mild, and add a peppery snap to salads and summer meals. 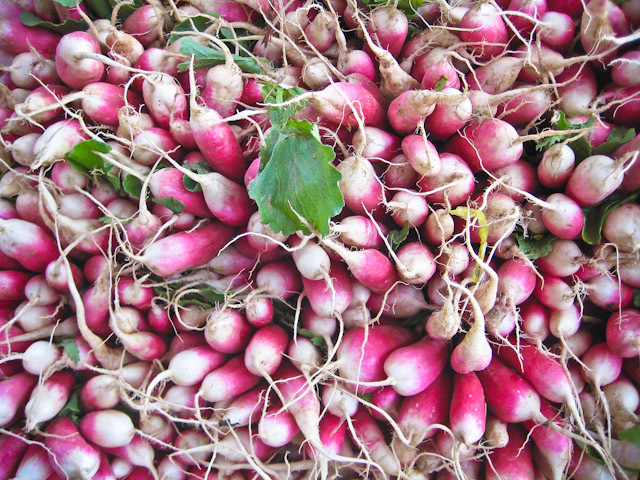 Try some this week, with this so-easy-my-sheep-could-make-it recipe for irresistible radish, butter, and sea salt crostini. 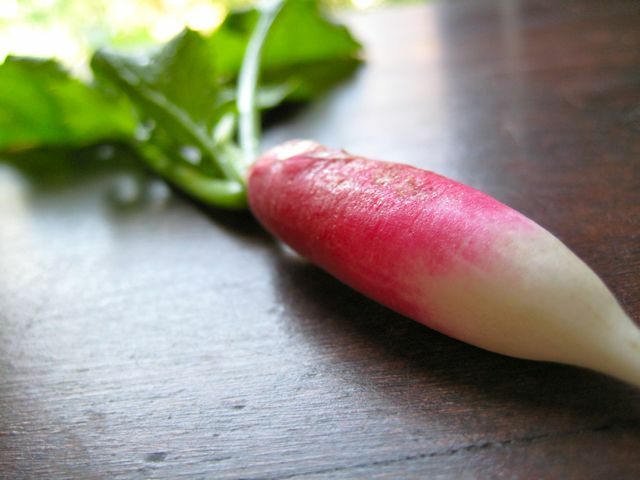 And don't compost the radish greens tops just yet. They are equally edible and equally wonderful. Treat them as you would other hearty bitter greens; sauteed and tossed with pasta, stirred into soups, or whirled into pesto. Here are a few ideas to try out from the kitchn.com. With sorrel in its tangy, bright abundance at the farmers' markets now and throughout the summer, this pistou (or pesto or coulis) is a dynamite way to show it off. 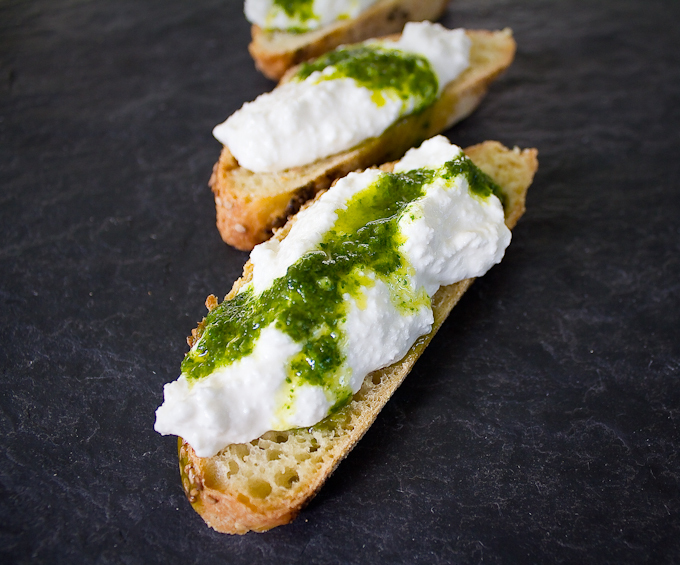 Set out a platter of baguette slices, ricotta, and the green stuff and let your BBQ guests at it for a DIY appetizer. Less work for you, no soggy for them. Or, as we did last night, set out a platter of it between you and your loved one on the porch and call it dinner. 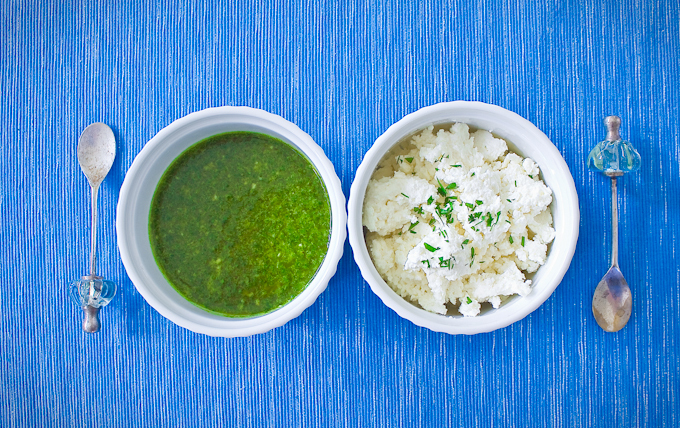 The lemony-green-herbal potency of the pistou is heavenly with the savory-creaminess of the homemade fresh ricotta. But it is also an incredible addition in any place where you want a little herby, slightly sour, punch. Toss it with warm pieces of boiled red potatoes for a new twist on potato salad, stir a small spoonful into a creamy root vegetable soup just before serving, toss with shrimp and orzo for a cold pasta salad, or drizzle over grilled vegetables, seafood, and chicken. This is also a wonderful recipe to use to put away sorrel for the winter. Make a big batch of the pistou and freeze in smaller portions, to stir into heavier winter dishes in the months to come. Combine sorrel, parsley, garlic clove, olive oil, salt and pepper in a blender or food processor. Blend until uniform and smooth. Taste and adjust salt and pepper to liking. Will keep in an airtight container in the refrigerator for up to a week, but is most green and most flavorful the day it is made. 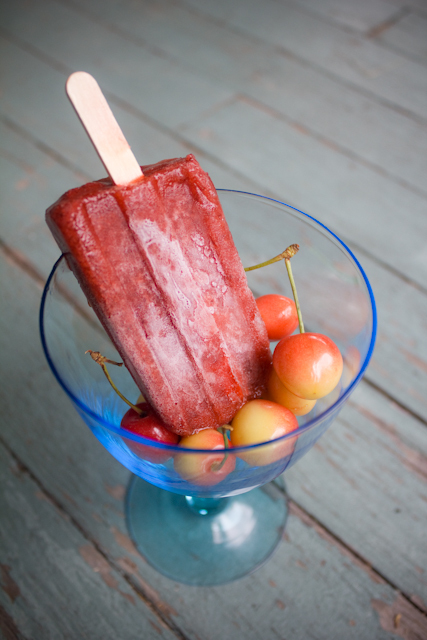 It can also be frozen, and thawed overnight in the refrigerator. Stir before serving. Top slices of baguette, or thinly sliced rustic bread, with a large dollop of ricotta. Top with a generous drizzle of pistou. Serve immediately. Steam or boil red skinned new potatoes. Cut into bite-sized pieces while still warm, but cool enough to touch. Toss with a generous amount of sorrel coulis. Chill before serving. 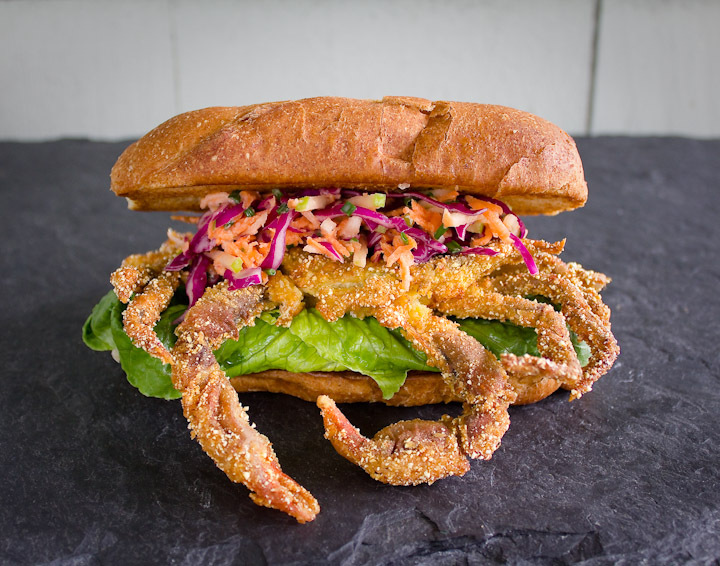 This remarkably quick meal is a colorful and crunchy way to use the insanely good soft shell crabs that are coming into season right now. I made this for my husband and I a few nights ago, and was so pleased with the speed to wow ratio. But in addition it was so so so good that we craved the exact same thing for dinner the following night with the extra crabs I bought to photograph for the blog. Though the crabs need to be served immediately after pan-frying, they take just minutes, and so still could be a great alternative for a small group BBQ, turning out crabs as you would burgers off the grill. You can also skip the rolls and just serve them atop a salad of greens and slaw. 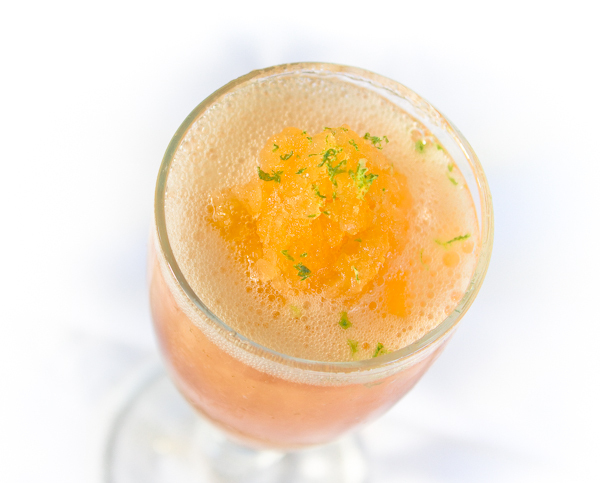 Here is another soda syrup recipe to accompany yesterday's homemade ginger soda syrup. Super refreshing and light, making me crave flip flops and sunscreen. 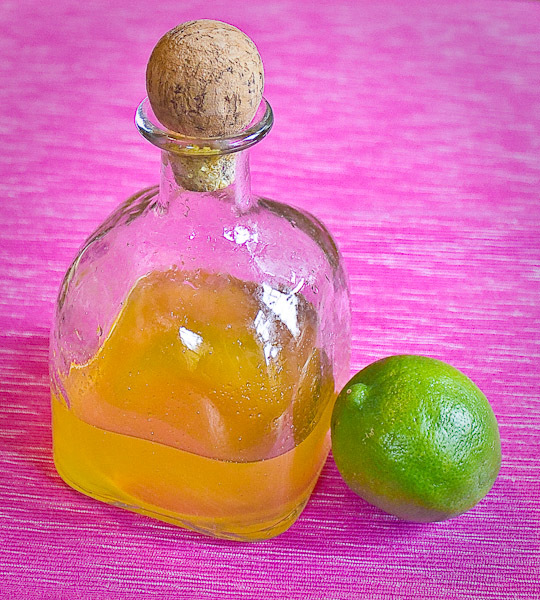 Try mixing a little of both syrups together for mango-lime-gingerlicious beach blanket bingo in a glass. Who says it's only april? makes approximately 1 1/2 cups. Place mango, mango pit, sugar, water, lime juice and zest in a small pot. Bring to a gentle boil, and the turn off heat. Allow to steep and infuse for thirty minutes. Strain through a fine strainer lined with cheesecloth. Squeeze cheese cloth to extract any remaining juices. 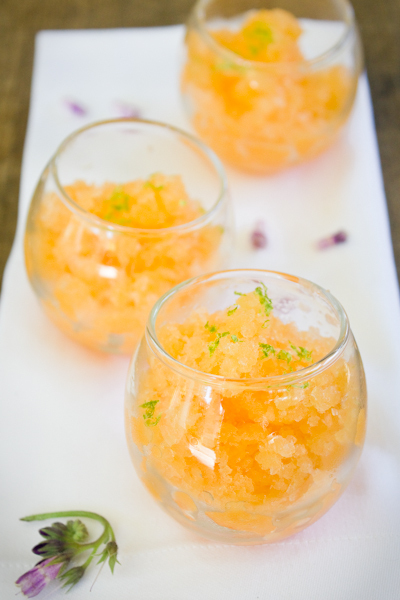 Mango Lime Soda: Mix 1 part soda syrup with 5 parts seltzer , or more or less to taste. Perhaps because of the few (very few) days of slightly decent weather we've had lately, my attention has recently shifted from hot teas and afternoon hot mochas to cold, effervescent beverages. We are not big soda drinkers in our house, almost none at all, for all of the obvious reasons (high fructose corn syrup, chemicals, artificial colors,and the environmental impact of all of the packaging and distribution.) But a small spell of stomach queasiness that my husband and I both shared not too long ago (lovely), had me at the grocery store searching for ginger ale, or even better a more gingery ginger beer, sans HFCS and with real ginger as an ingredient. After not an easy time I did find a couple of options, but all ended up being too sweet for my liking. I've been following the blog and success of Brooklyn's P&H Soda Co., a small artisanal producer of all natural, small batch, soda syrups, for a little while now. With flavors including hibiscus, lime and cream, I can't wait for my next time in the city to pick up some at one of their new retail locations. But it also occurred to me that with my flail at the grocery store, and with summer gatherings-on-the-porch weather quickly approaching, perhaps I should just get myself in the kitchen and try to figure out the whole shebang, or at least part of the shebang, myself. The result made me and my stomach very happy. And like so many of my DIY endeavors, was ultimately not difficult, offers endless delicious possibilities, and has everything I want and nothing I don't. 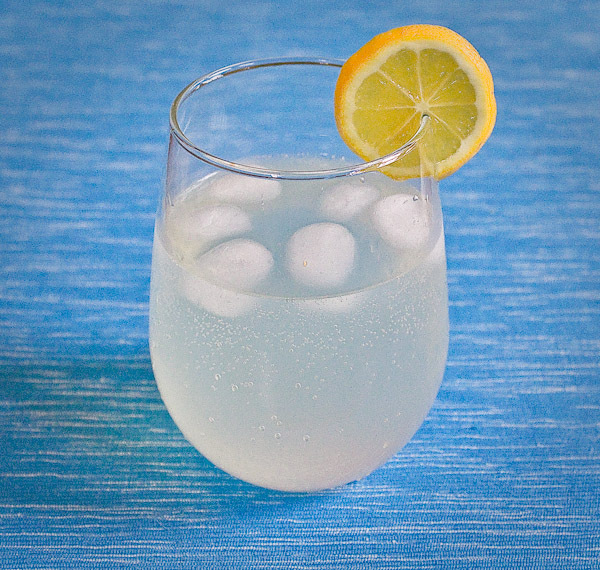 I mixed the gorgeous syrup with seltzer for an outstanding ginger soda. (A side note, we have owned the SodaStream home seltzer maker for a few years, use it every day, and it is one of my top 3 favorite things in the kitchen. It has saved us a fortune, and saves thousands of plastic bottles from having to be manufactured, recycled or land-filled.) I'm also looking forward to using the syrup for mixed drinks and ginger martini's, or to wake up lemonade. The best part of all is that you can control the sweetness, by adding more or less sugar to taste, and the ka-pow of the soda, by adding more or less syrup to your seltzer. Experiment, concoct and enjoy. TIP: To peel ginger, wash and then use the front of a small spoon to scrape away the thin peel. It will come off easily and a vegetable peeler tends to remove too much of the ginger meat. 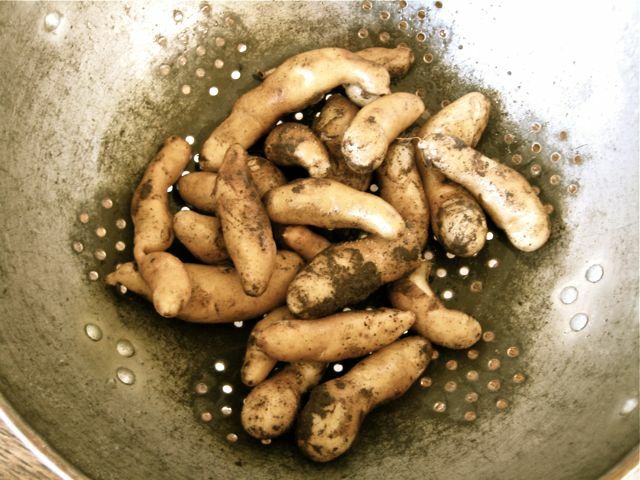 Grate the ginger, and gently transfer it to a saucepan, careful not to squeeze out or lose any of the flavorful juice in the process. Add the sugar, water, and lemon juice to the ginger. Bring mixture to a gentle boil and turn off heat. Allow mixture to steep and infuse for thirty minutes. Return the ginger mixture to a gentle boil and reduce it by about half, until it has a slightly thicker, more syrupy consistency. 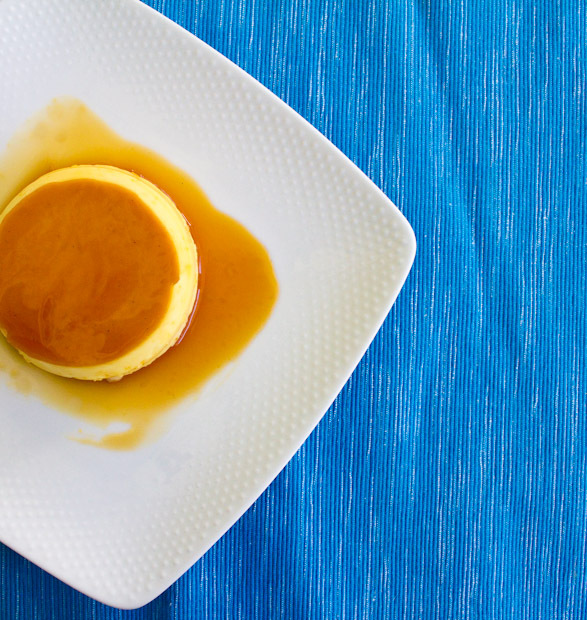 This is just really evaporating the extra water, and adjusting how concentrated you want the syrup to be, so go as long or short as you want, but do not let it cook so long that the syrup starts to get very thick, turn amber in color and caramelize. Remove from heat and allow syrup to cool. Strain through a fine strainer lined with cheesecloth. Squeeze cheesecloth to extract any remaining juices. Refrigerate for up to a week. 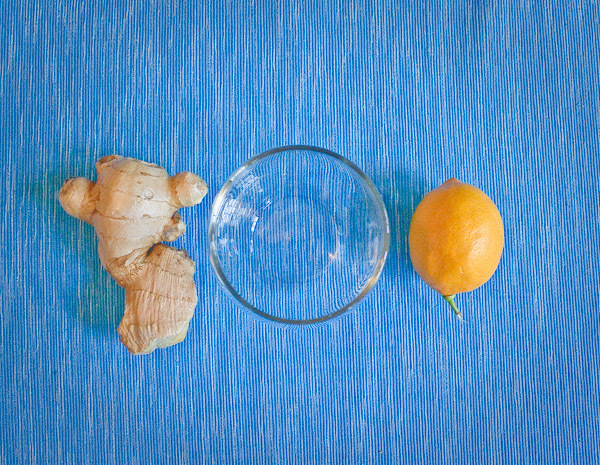 For ginger soda: Combine 1 part ginger syrup with 4 parts seltzer, or more or less to taste. As a follow-up to my previous post about all things salad dressings, here is a recipe for another rock-star of a vinaigrette, following the same formula: 1 part acid + 3 parts oil + seasonings and flavoring ingredients. This is dynamite tossed with fresh blanched local beans, perhaps adding soba noodles for downright craveable homemade sesame noodles. But it is also wonderful as a marinade for grilled chicken, beef, or pork, with the acid of the vinegar bringing the added bonus of a great meat tenderizer. Combine the vinegar, garlic and ginger in a bowl, and allow to sit for 10 minutes, to infuse the vinegar with the flavor of the garlic and ginger. Then, while whisking constantly, pour the sesame oil into the bowl in a slow, thin stream. Taste, and adjust salt. Serve as a dressing for a green salad, tossed with cooked vegetables (green beans, broccoli, carrots, sautéed greens) or as a marinade for grilled meats. Blanch green beans, by cooking in a pot of boiling, heavily salted, water for a few minutes, until crisp-tender. Immediately remove with a slotted spoon to a bowl of ice water to shock to stop the cooking. Drain and pat dry. 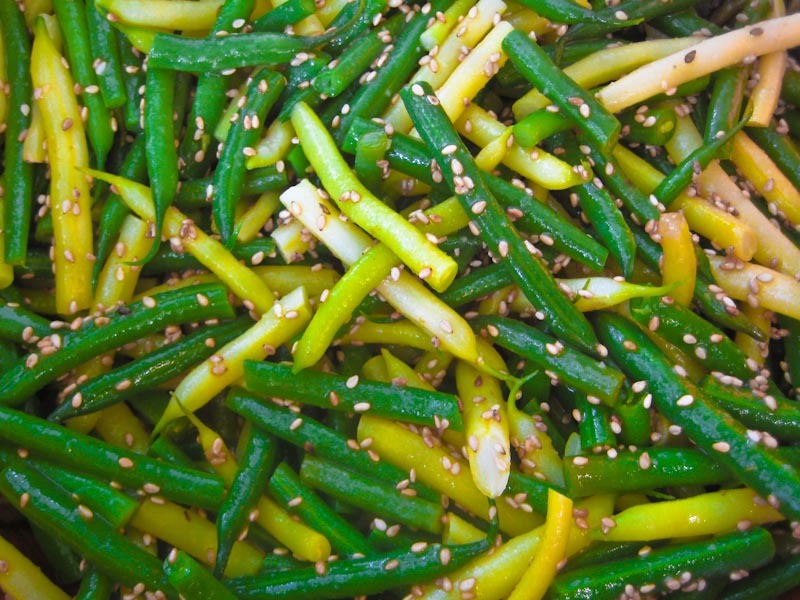 Toss with Sesame Ginger Vinaigrette and toasted sesame seeds. Can combine with noodles, like Japanese buckwheat Soba noodles, for a more substantial dish. Top with slivered scallions and toasted sesame seeds. Just about four years ago, Mark Bittman wrote a great piece in the New York Times; A Well-Dressed Salad Wears Only Homemade, and it got me thinkin'. Why did salad dressings feel like such a mystery? Why is there usually a huge amount of grocery store real estate devoted to them? Why are they so darn expensive? A recent peek at dressings in my grocery store upstate, showed even the cheapest dressings at around $2.50 for an 8 oz bottle, jumping to $3.59 a bottle for something just slightly more natural. That's $40-57 a gallon--compare that to something like the price at the pump, and it feels like complete lunacy. The other glaring issue I noticed was that sugar, often in the form of high fructose corn syrup, and WATER, frequently make up two of the first three ingredients. Again, lunacy. 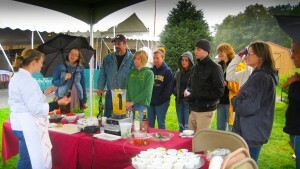 A few weeks ago I did a cooking demonstration at a local harvest festival. 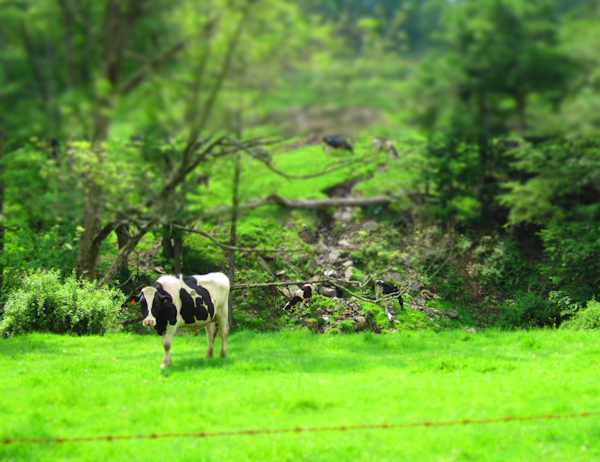 Showcasing the gorgeous local produce (supplied by Beaver Dam Brook Farm in Ferndale, NY), I did a brief primer on dressings and vinaigrettes. As I was myself when I first started cooking, many of the audience members at my cooking demos were surprised at how fast and simple it was to make a vinaigrette. And so much less expensive while eliminating chemicals, emulsifiers, and that big dose of unnecessary sugar. It seemed crazy that there we were, at a huge farmers' market, a group of people devoted to buying the freshest, least traveled, produce, and yet were not thinking much about then topping that produce with something that was possibly over a year old (when purchased, not to mention the time it has sat on that narrow shelf on the door of your refrigerator), gooey, syrupy, and most likely swimming with ingredients from a factory and not a farm. Put the acid in a bowl with the seasonings and flavoring ingredients, if using. If you have time, allow that to sit for 5-10 minutes to better infuse the vinegar. Then while whisking continually, pour the oil into the acid, in a slow, steady stream. The mixture will begin to come together and emulsify. You can also do the same, a bit quicker, with a fork for a "broken" vinaigrette. Or make things very easy and put it in a blender, instead of a bowl, in the same order, streaming the oil in the top while the blade is going. This works particularly well if adding fruit or vegetables for flavor. Most commonly, extra virgin olive oil is used, but gorgeously flavored hazelnut, walnut, pumpkin seed, and avocado oils are also becoming widely available. The acid can be lemon juice, lime juice, vinegars (balsamic, white or red wine, sherry, rice, cider) or a combination. Season with salt and pepper, and flavor with shallot, garlic, mustard, pureed fruit or juice, honey, pureed roasted vegetables, fresh herbs, dried herbs, or ground spices. One of my favorites is a three-ingredient vinaigrette of lemon juice, sea salt, and hazelnut oil over a green salad with roasted beets. or this Roasted Cherry Tomato Vinaigrette, I posted recently. The formula is simple, it's not rocket science, you can hardly go wrong, and the options are so much more rewarding than the same-old same-old you'll find on the dusty eye-level shelf at your store. Do yourself a huge favor, work this into your life. Experiment, taste, and experiment some more. Tonight. Put it away put it away put it away now. Red hot chili peppers. 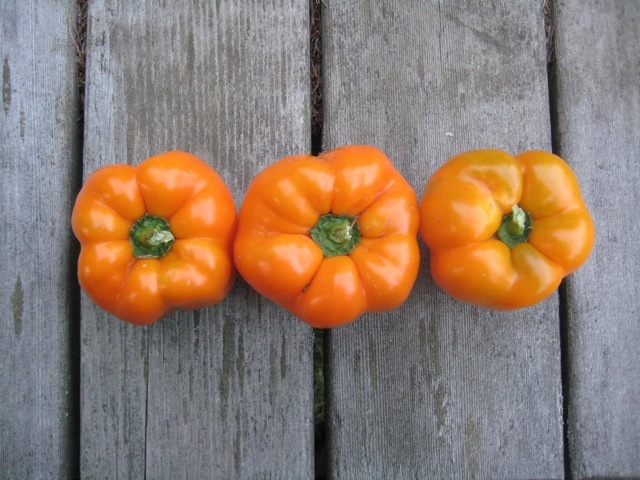 Sweet orange bell peppers. Long curly Jimmy Nardello peppers. Short stubby serrano peppers. Peppers are still abundant at the farmers' market, super sweet this time of the season, and the easiest vegetable to put away for the winter months. 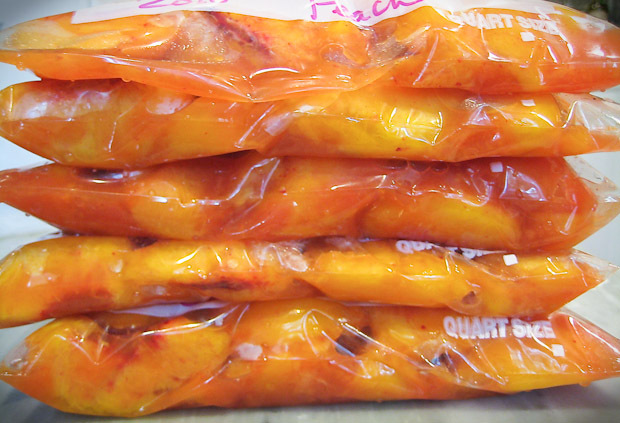 You don't need to peel them or blanch them or can them--they can be frozen raw! Wash the peppers and dry thoroughly. For larger, sweet or bell peppers, cut in half lengthwise, and remove stem, seeds and ribs. They can be left in halves or sliced smaller. Smaller peppers, particularly tiny chili, jalapeno or serrano peppers can be left whole. Put in resealable freezer-safe bag or container and freeze. That's it. Peppers do lose some of their crisp texture when frozen and thawed, but these are great to slice up and saute with onions, cumin and herbs for a quick fajita, burrito, or omelette filling, or to add to a slow simmered stew. The hot peppers are easy to slice finely when frozen, returning the rest to the freezer, to add just a small shot of heat to a dish. Above all, they are packed full with flavor right now, far outshining anything you will find them passing off as a pepper in February. Don't delay! Our 52 heirloom tomato plants are in their final days, but have heroically yielded hundreds of pounds of beautiful fruit this year. A very triumphant relief, following the yield of six (yes, just six) tomatoes we got from the same number of plants last summer in the throws of the huge tomato blight. We are still managing to gather buckets of red, orange, and golden cherry tomatoes almost daily, though are even a little tomatoed-out after weeks and weeks of eating nothing but. This roasted tomato vinaigrette is one of our favorites, and so much so it was served over sliced local tomatoes at our wedding three Augusts ago, and printed on the back of the menu. As the weather gets cooler, and I automatically start to crave autumn foods, this hanger-on recipe from summer works beautifully over sauteed hearty greens, the last of the zucchini and summer squash, grilled pork, chicken or fish, as a tangy base for a stew, as well as a dressing for a simple green salad. I also love to can a few pints of it in our pressure canner to wake up meals, or dip crusty bread in, in the dreary days of winter. 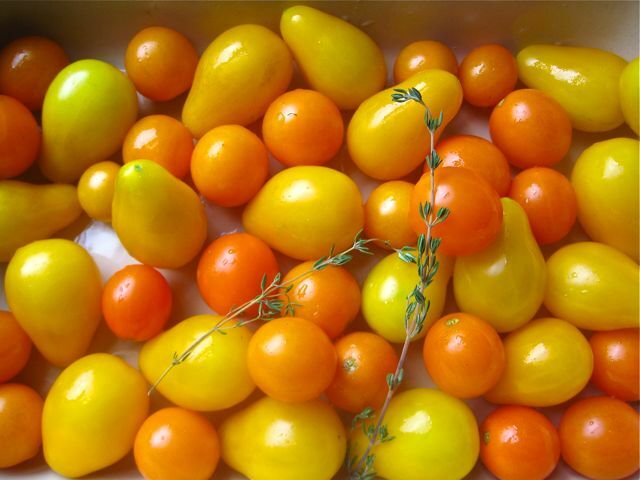 In a baking dish, combine whole cherry tomatoes with the garlic cloves, thyme, oregano, and olive oil. Add a pinch of salt and a few grinds of pepper. Mix well to evenly coat with the oil. Bake until tomatoes are soft, but still hold their shape, approximately 30 minutes, depending on ripeness. Allow to cool. 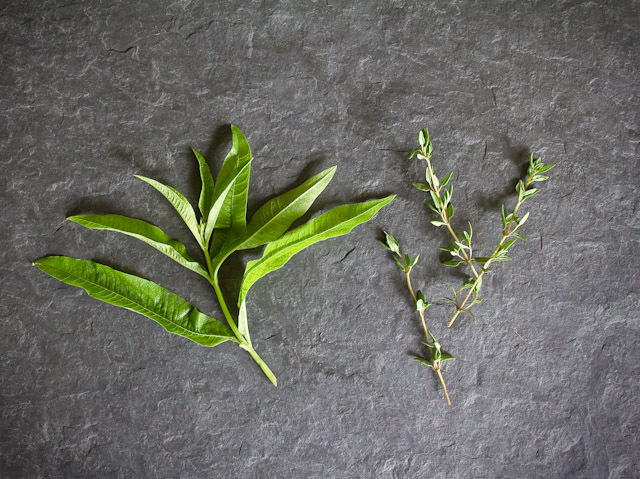 Carefully remove any thyme leaves from the stems that are still attached, and discard stems. Put roasted tomatoes, garlic, herbs, and any juices from the dish into a blender. Puree. Add vinegar and pulse to combine. Taste and adjust salt or vinegar, if needed. Additional oil can be added if dressing feels too loose or too acidic. First, yes, it is a terrible pun. But in all honesty, I had a dream about writing this post, and that is the title I watched myself type in the dream. So who am I to interfere with subconscious inspiration/intervention? Our garden is still loaded with beautiful food. But as is the case when September shows up, the plants are not looking quite as robust as they did a few weeks ago. There is definitely a sign that it is the end of the season and these plants are tired. However, our gorgeous Five Color Silverbeet Chard, that was looking a little peaked in the hottest days of August, has started to really perk up in this last week, with it's cool evenings. "If I could only save one of my seed packets from the deluge, the heirloom vegetable I’d probably grab is five-color silverbeet. It is not silver (silverbeet is Australian for Swiss chard), but has broad stems and leaf ribs vividly colored red, yellow, orange, white or pink. Each plant has one stem color, but all five colors persist in a balanced mix in this beloved variety. It was the first seed variety I learned to save, and if in my dotage I end up in an old-folks’ home where they let me grow one vegetable in the yard, it will be this one." 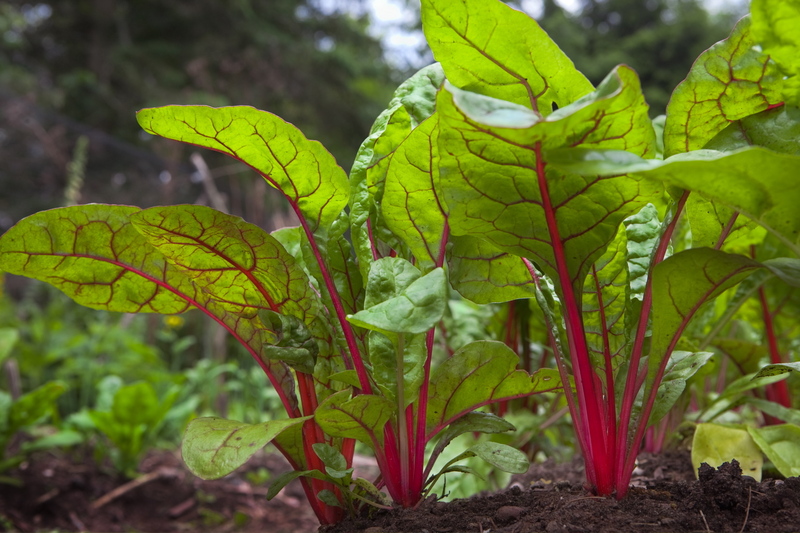 Chard is a wonderful culinary green, loaded with iron and antioxidants. 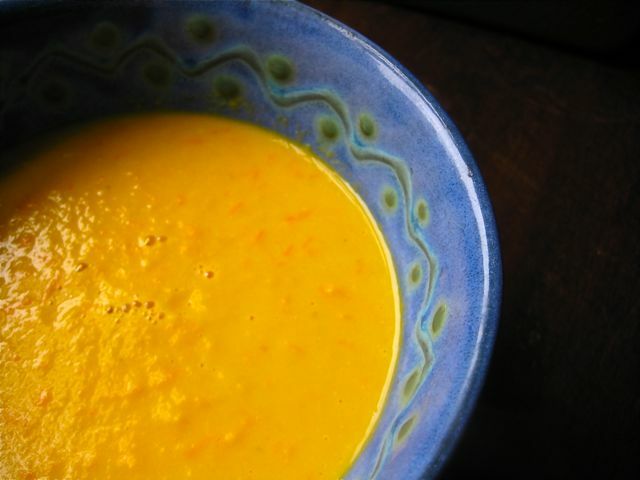 It stands up well in soups, and sautés, as well tarts and fillings. It is a great alternative to spinach and kale, and unlike either, comes up early in the garden season and lasts through early frosts. 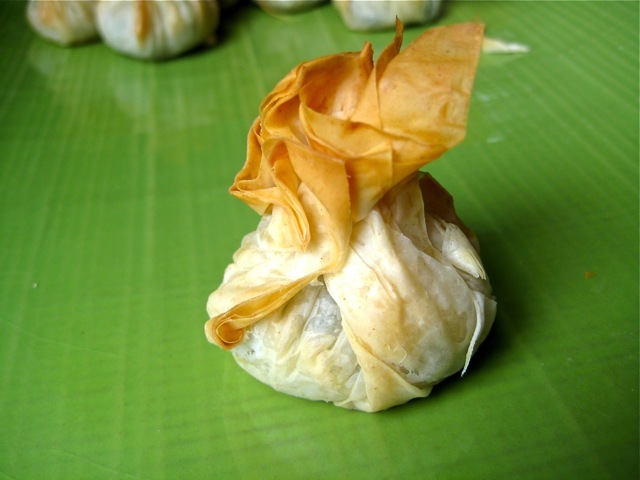 With it too warm to have spinach in the garden lately, I substituted chard recently in Spanakopita-inspired phyllo purses. These little bundles are impressive and loaded with summer flavor. 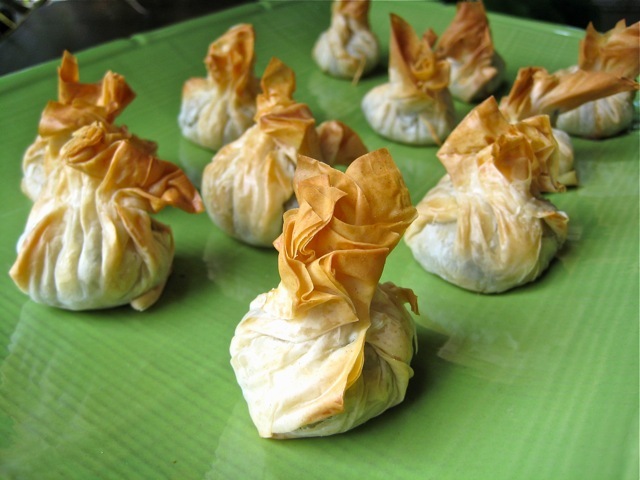 The filling is also equally good folded into larger phyllo pockets for a great lunch or vegetable dish. 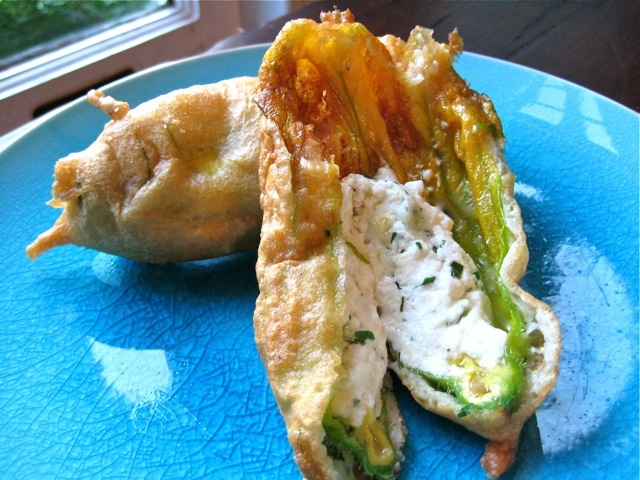 makes approximately 30 hors d'oeuvres bundles, or 10 large pockets. Heat the oil in a large pan. Add the diced onion and gently saute until fragrant and translucent. Add the chopped chard, in large handfuls, as it starts to wilt down. Saute for a minute more until just cooked, adding the dill and parsley about 30 seconds before removing from heat. Using either a spoon on the edge of the pan, or pouring the mixture into cheesecloth, squeeze out and drain as much liquid as you can from the vegetables. Add the feta cheese to the chard mixture and evenly combine. Taste the mixture at this point before seasoning. Feta is salty and you may only need to add pepper. Once you are happy with the seasoning, add the egg and mix well. Unwrap the phyllo dough, and keep flat under a damp towel or paper towels. On a counter or cutting board, place one sheet of dough. Brush dough lightly, but evenly, with melted butter, and top with another sheet of dough. Repeat so you have a stack that is three sheets thick. With a large knife or pizza cutter, cut sheets into 6 pieces (down the middle the long way, and then in thirds in the other direction). Place about a tablespoon of chard mixture in the center of one of the phyllo rectangles, gather up corners, and twist slightly in one direction. Place on a cookie sheet. Repeat with remaining mixture and dough sheets. Alternatively, you can cut the stack of three sheets in half, lenghwise, put about 1/3 of a cup of mixture in the lower right corner, and then fold in triangles, as you would fold a flag. Bake for 15-20 minutes, until dough is golden brown. Bakelightly longer for the larger triangles. This, all too brief, time of year when the garden is offering up treasures I would drive multiple time zones for in February, I find myself stumped in the kitchen. Surprising, since I have before me the best raw materials I will see all year. But that’s just the point. I want to step aside, get out of their way, and let these vibrant little bundles do what they do best all on their own. How can I possibly improve upon late summer perfection? This year for the first time we are growing in our gardens elegant little french breakfast radishes and delicate and creamy fingerling potatoes. The radishes have been surprisingly successful and grow quite rapidly. 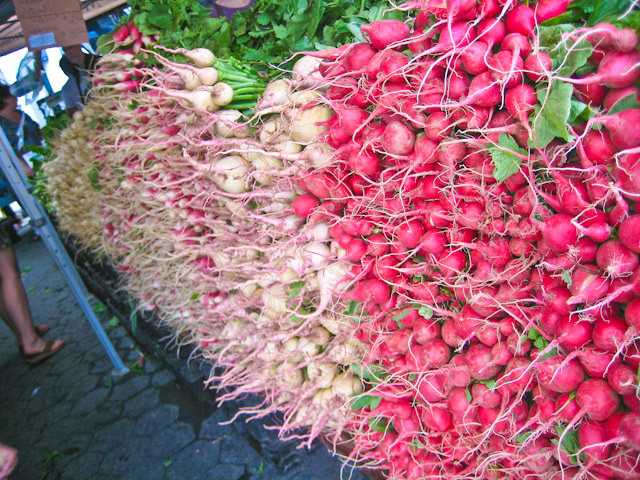 As a kid radishes were one of only two foods I wouldn’t touch (the other was PB&J….) But these are crisp and bright, and have a wonderfully mild peppery zing. The potatoes have just started to bear fruit, almost a foot underground. I have been diligently nursing the plants all season, mounding and mounding the dirt. When I read on the internet the other day that the first small new potatoes should be ready around day 60, I was sent into a complete impromptu digging frenzy. No plan, no shovel, and dirt painfully jammed very deeply under my triumphant fingernails. But so very worth it for the small two serving colander-full that I brought in for supper. They were a revelation. Fragile, tissue-paper thin skins, and a complex flavor that reminded me that these were a delicacy, not just a background starch. Here are two quick and simple recipes that showcase these vegetables in their purest form, with nothing covering up their brilliant flavors. 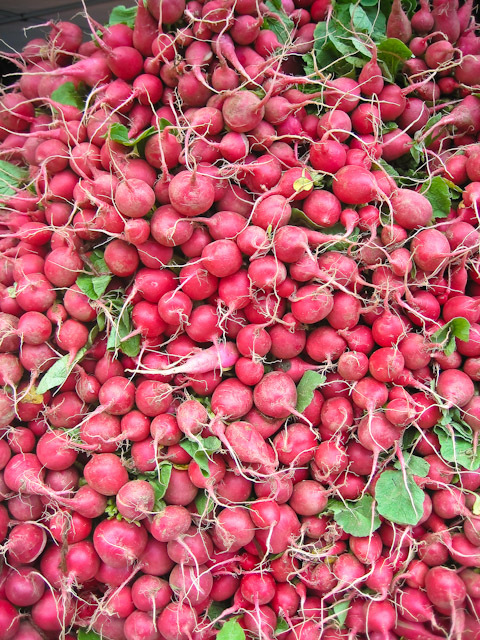 If you can get beauties from the farmer’s market, or your garden, it is like tasting potatoes and radishes for the first time. Cut potatoes, if necessary, so that they are fairly uniform in size, but try to keep as many whole as possible. Toss with enough olive oil to evenly cover. Add thyme leaves, a few large pinches of salt and grinds of black pepper. Toss again to evenly distribute. Pour into a roasting pan or baking sheet, preferably in a single layer. Roast in the oven until tender, about 40 minutes, depending on the size of the pieces. Our few small winter squash plants, that I started from seed this year, have taken off, and taken over, and are now literally climbing the walls of the new squash garden we put in. It is still amazing to me that one tiny 1.5 cm long seed can turn into a gigantic sprawling little-shop-of-horrors-like vine with leaves that are waist-high. 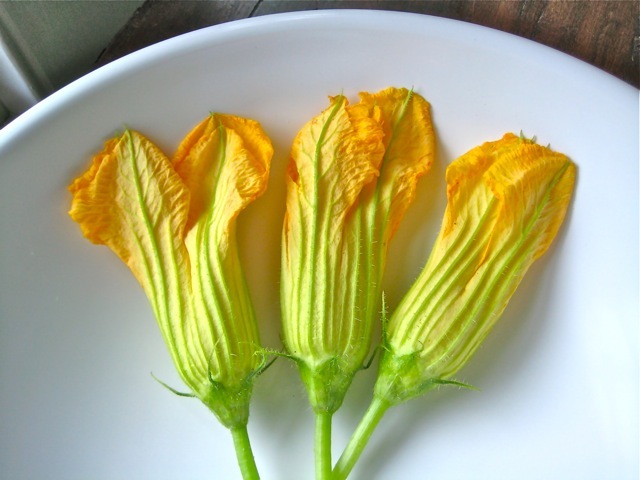 Looks like we will pretty certainly have an abundance of squash, and currently have an abundance of glorious, delicate, and elegant squash blossoms. If picking them yourself, try to do it early in the day, when they are open and slightly more resilliant--they tear very easily. 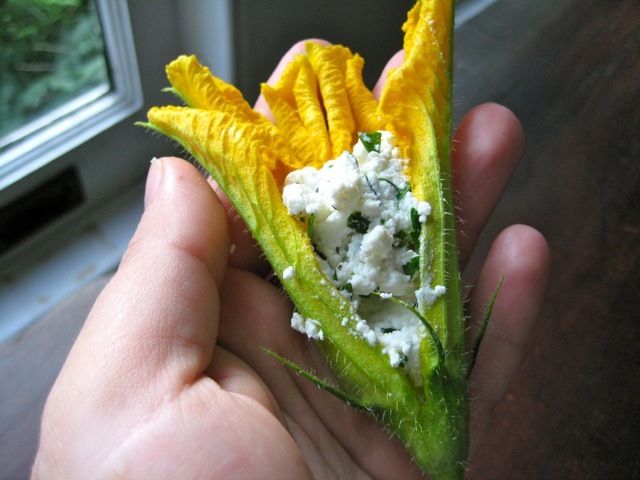 Also, you'll want to pick the male flowers, as the females are the ones that the squash will grow from. So with our glut of blossoms, guess I'll just have to stuff them with creamy cheese and fry them, fry them, fry them. Oil, canola, vegetable, peanut, for frying. 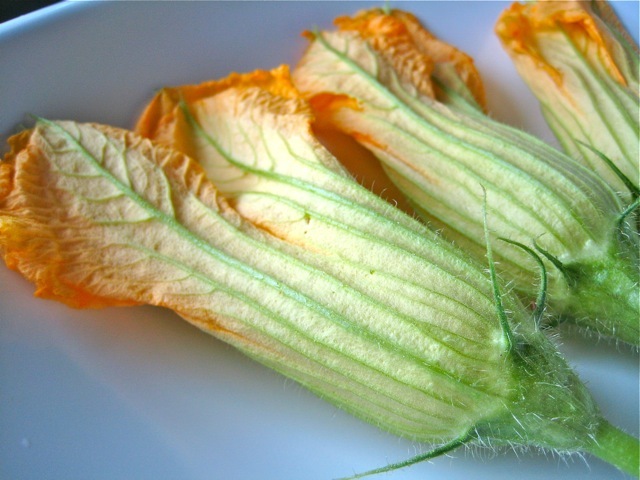 Carefully remove the anther from the inside of the blossoms (if using male flowers) with scizzors. You can cut a seam down the side if it is too hard to get in there without tearing the flower. 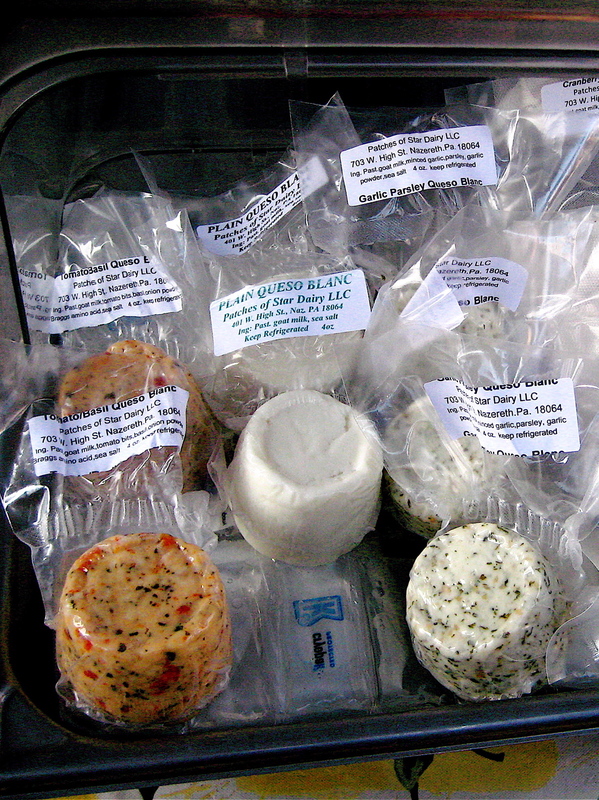 Combine the cheese with herbs and season to taste. 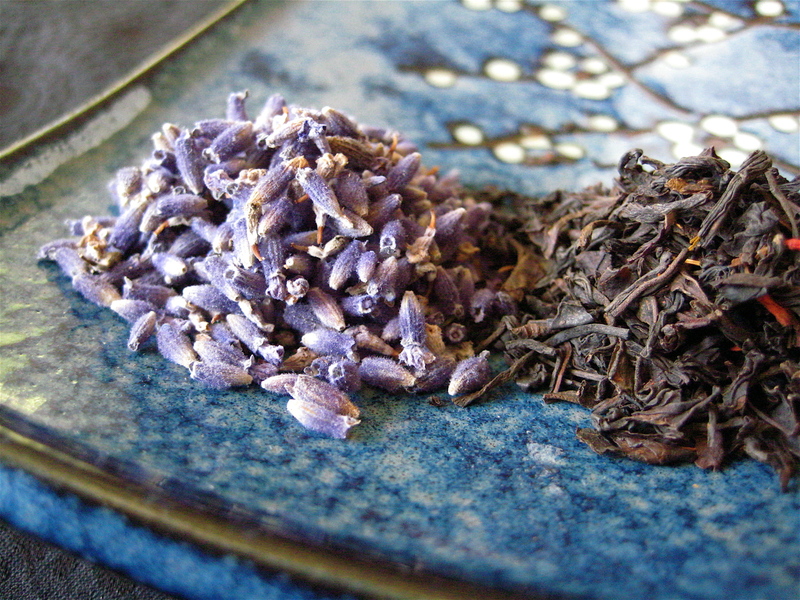 Gently stuff each blossom with about a tablespoon of filling. Combine dry ingredients for the batter. Add the egg, and then the cold beer or seltzer. The batter should be the consistency of a loose pancake batter. Heat 3 inches of oil in a heavy bottomed pot to 350 degrees. Gently dip each blossom in the batter, letting the excess drip off. Carefully lay the blossom in the oil, frying until golden brown, turning occasionally. Remove with a slotted utensil, and drain on a plate lined with paper towels. Season with salt immediately and eat right away. 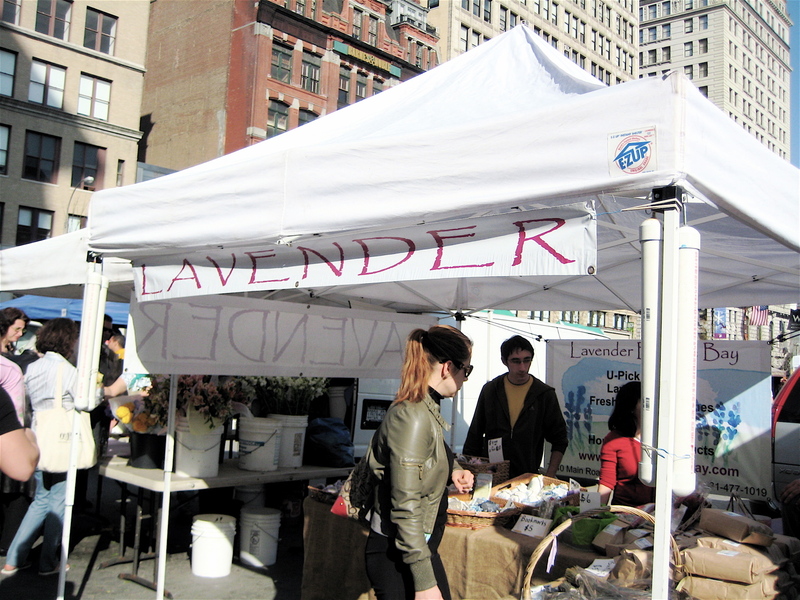 On a trip to the farmers market it doesn't serve you to bring a list or to have rigid expectations. The most effective shopping there is always done by just discovering what is the very best of this week's offerings. As mentioned before, that can sometime be rough in the less produce-friendly times of year. This week the stars, or farmers, seemed to align. There are a few bonuses of spring starting to show up, and enough cold storage winter vegetables left to anchor a recipe. 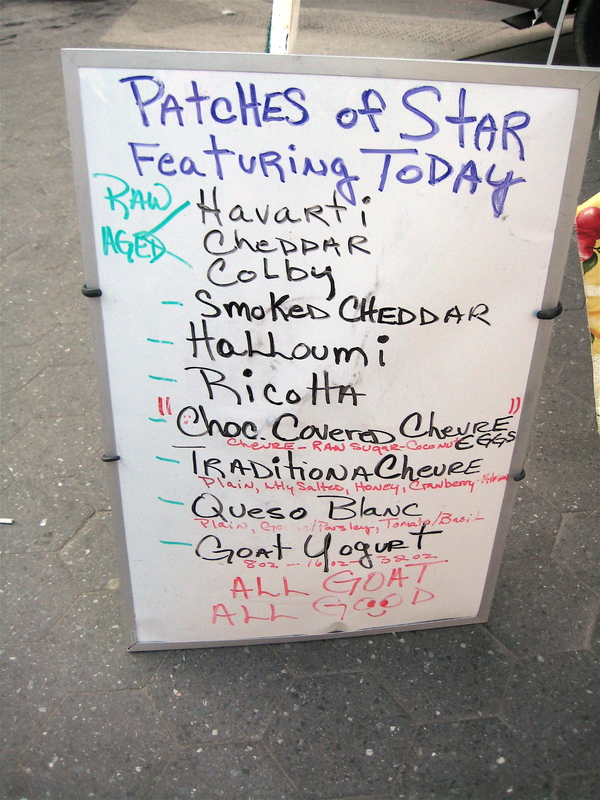 I found sweet, plump shallots, an abundance of hearty greens, luscious queso blanc made from goats milk, and had a few bags of organic polenta from a farm in Ithaca, NY, I had stocked up on during a previous market day. They all came together beautifully in this comforting, yet bright dish. A great vegetarian meal, or elegant side dish, that could be easily expanded to a more substantial meal by adding some braised chicken thighs or aromatic local sausages to the mix on top. Bring the stock to a boil. Gradually whisk in polenta, and return to a gentle boil. 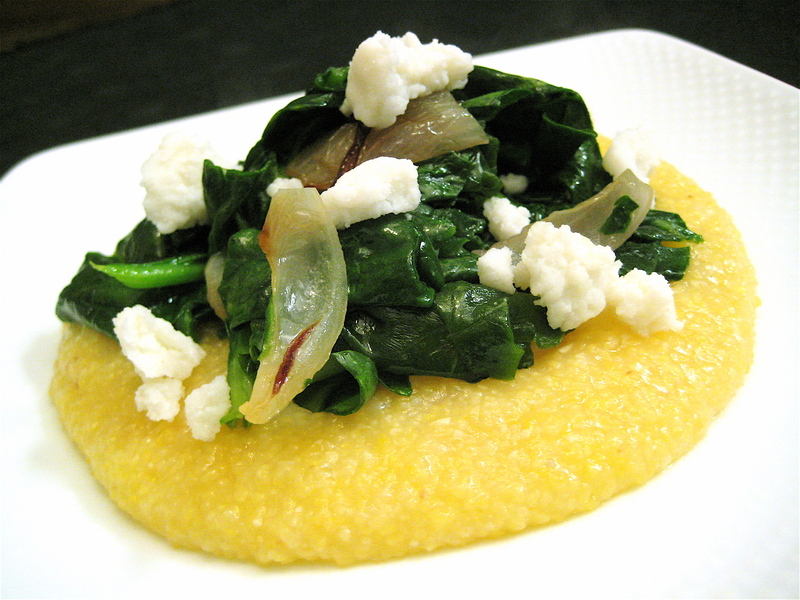 Cook for 5-8 minutes, stirring frequently, until grains are at desired softness, polenta has thickened, and excess liquid has been absorbed. Season with salt and pepper to taste. You may add a tablespoon or two of butter or olive oil to add some richness. Heat a tablespoon of cooking oil in a wide pan. 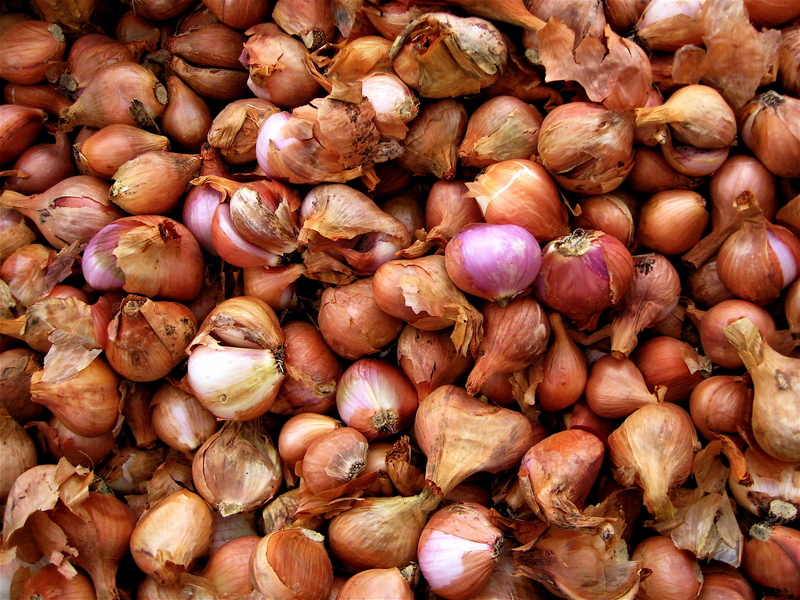 Add shallots and cook over medium-low heat, slowly, until slightly caramelized, about 10 minutes. Increase heat and add greens, and saute just until wilted. Season with salt. 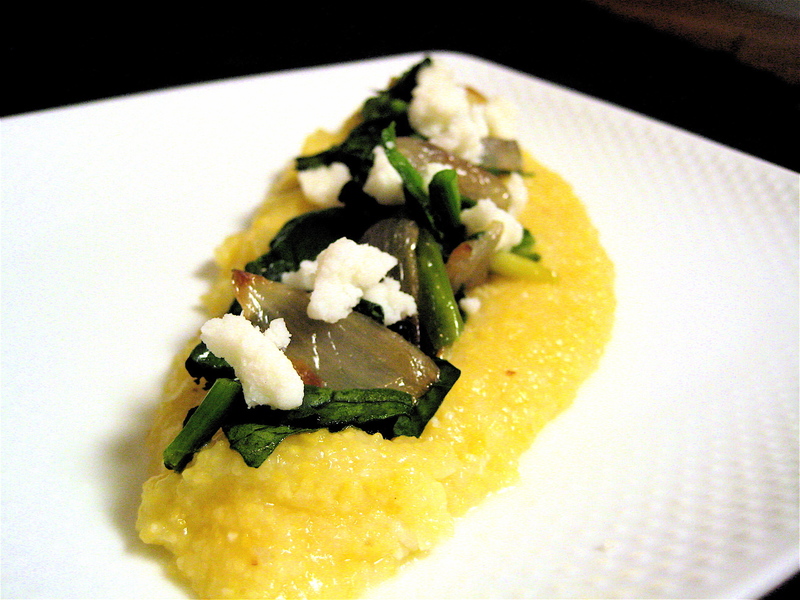 Spoon polenta on plates. Top with greens and shallots. Crumble goat cheese on top.